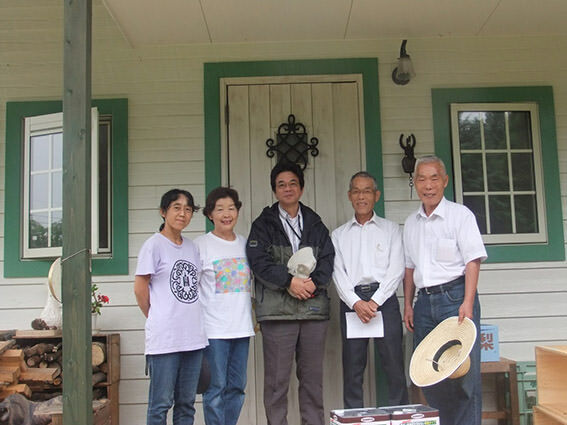 On Monday, June 13, Mr. Okazaki and Mr. Sato both of JMF member and President Takahiko Yoshiyuki of Kyushu Mennonite Church Conference and Emiko Sato of Miyazaki Minami church member, we four people visited disaster areas. 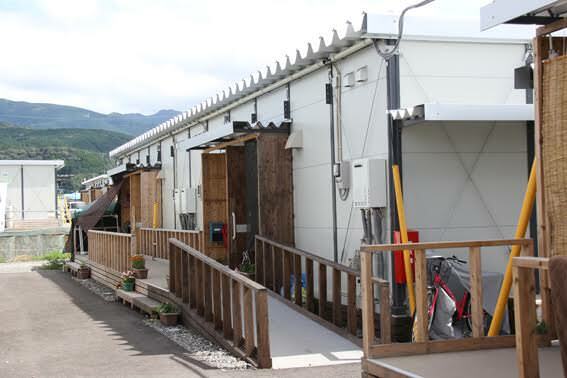 At first, we visited the office of Kyushu Christ Disaster Center that was formed this great earthquake soon after. 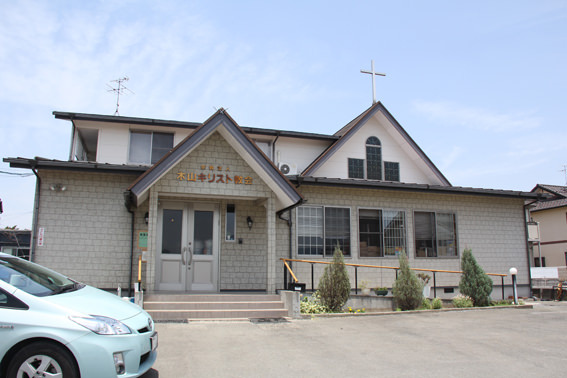 This office was in Kumamoto Harvest Christ Church until May, but now is in Ueki Christ Church in Kita Ward, Kumamoto city from June. 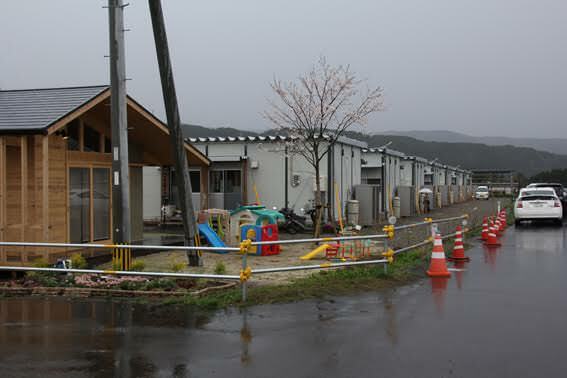 They borrow the building of this church and are active base in here. 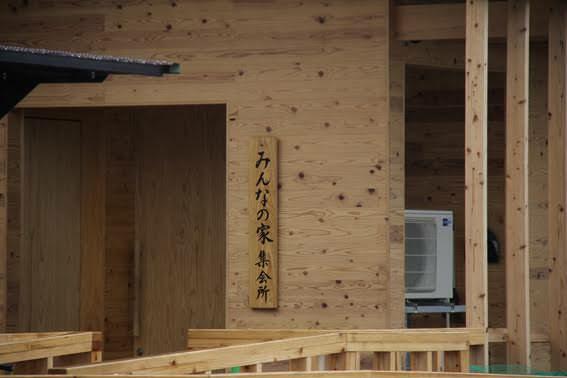 When we visited there, it was before noon. Ms. Tamaki was in the office. 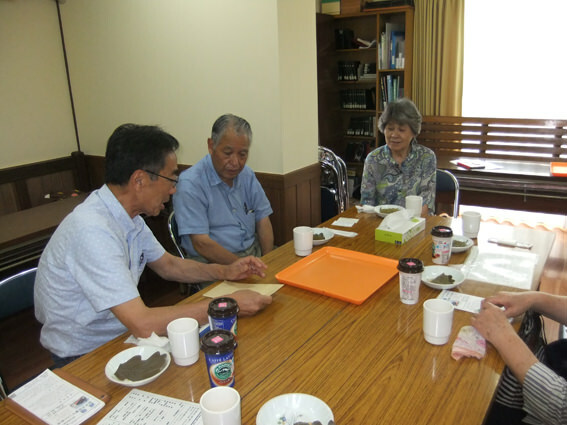 We heard about their activity from her, and we gave the donation from Japan Mennonite Fellowship or JMF for the support of their activity. 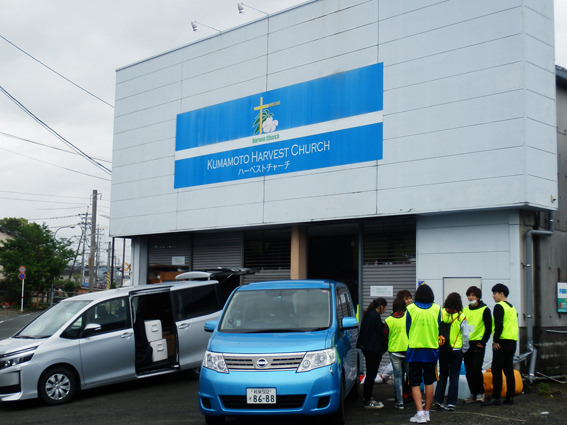 And then we visited the Kumamoto Kita Bible Christ Church. 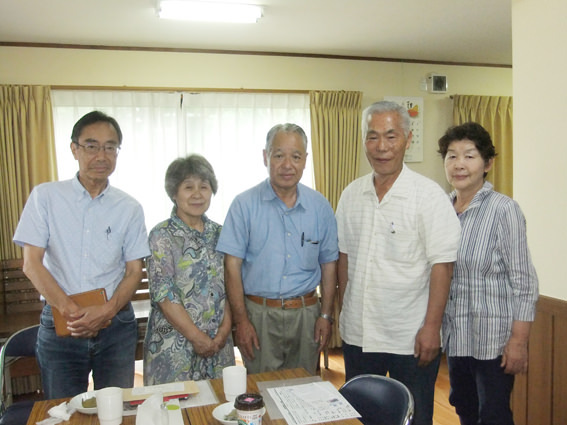 We met Pastor Toyose Takeshi and his wife of Kumamoto Higashi Bible Christ Church which was broken their church building in Masuki town. 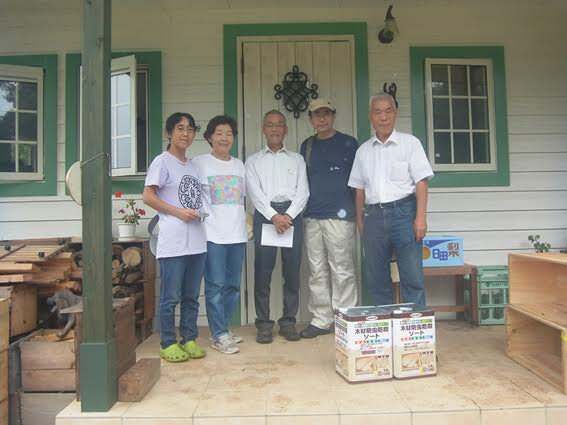 And we gave our donation to them too. 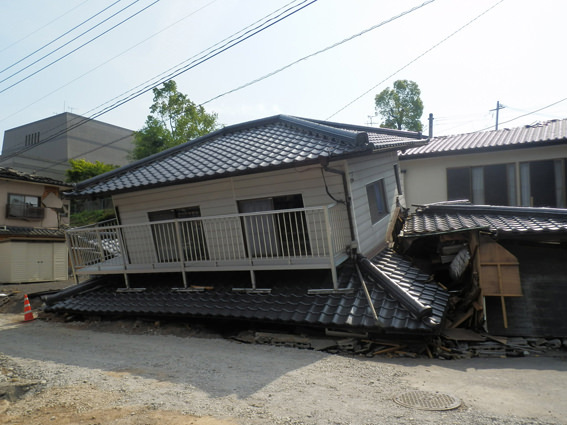 Their house was broke like this that happened earthquake so many times. 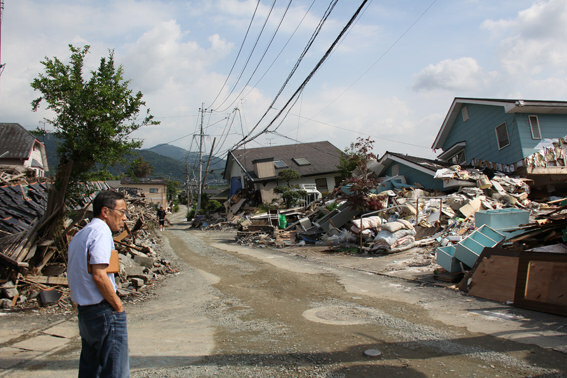 After that, we visited to the affected site of Masuki town. 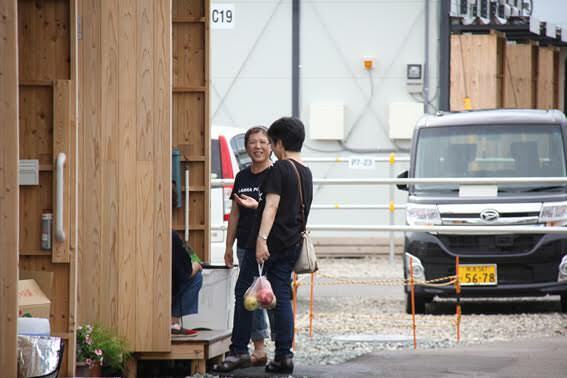 Mr.Okazaki stood there in utter amazement. 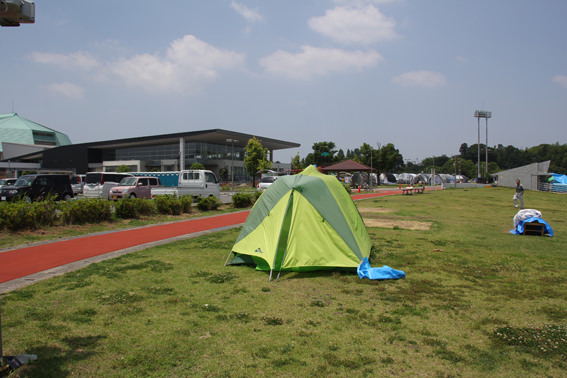 Some tents were still set in the parking lot of Masuki Town Cultural Center, and there were the people who lived a life there. 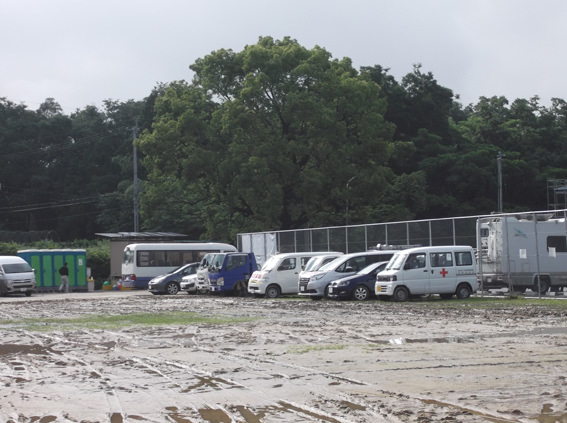 The camp ground becomes “the removal” in the end of May. 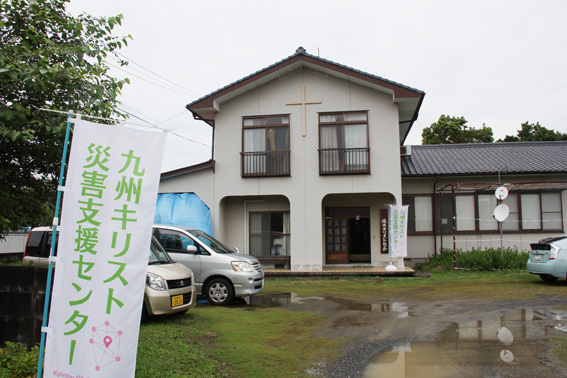 Finally, we saw the Kiyama Christ Church from outside and we gave prayer of the revival to God, and we left for home each. 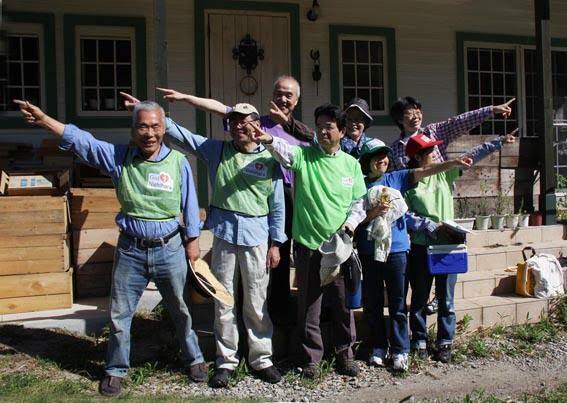 We went to Masuki town in Kumamoto on May 30 and May 31 as volunteer workers. 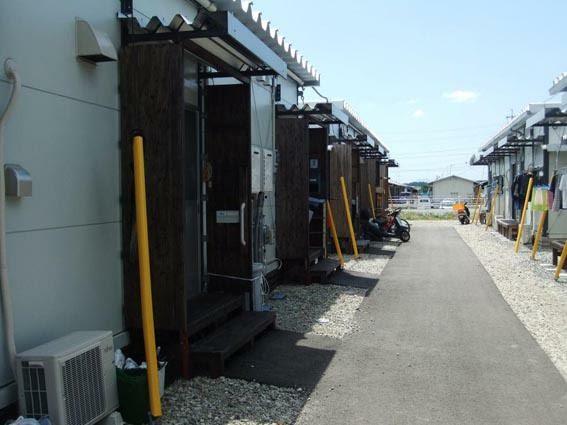 This is a volunteer center operating in Masuki town. 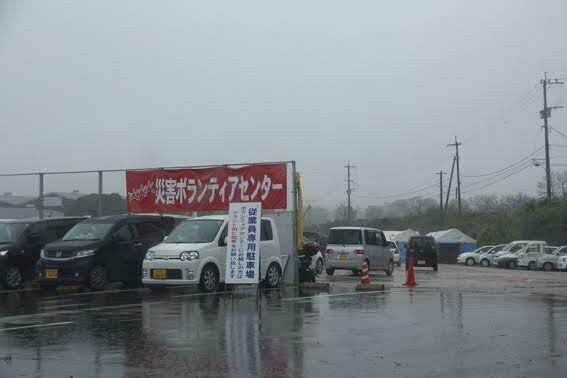 Because of raining all day of Monday May 29, it is closed a volunteer center. And ground is also such a condition. 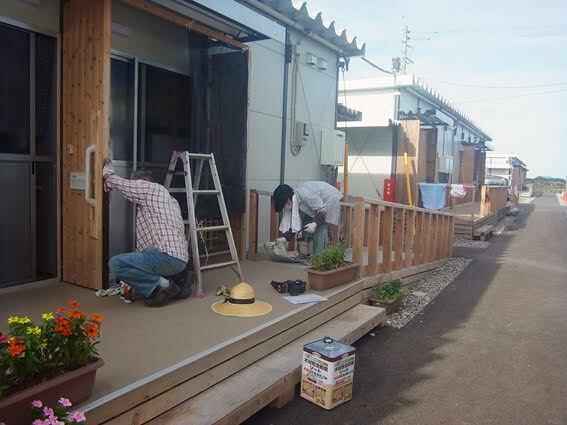 The acceptance of volunteer worker is from eight o’clock in the morning. We waited in our car because a lot of volunteer workers were coming until then. 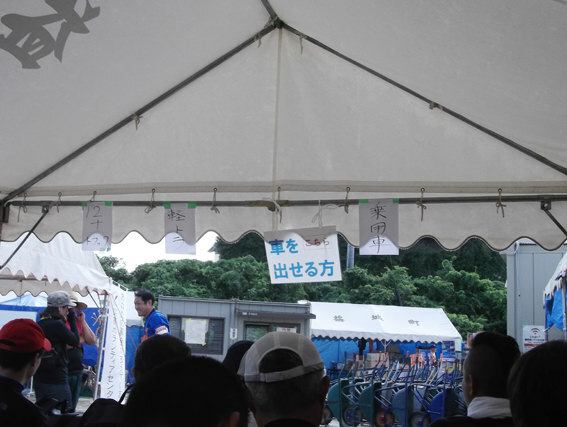 A guide appears to line up new volunteer and continuation volunteer separately. 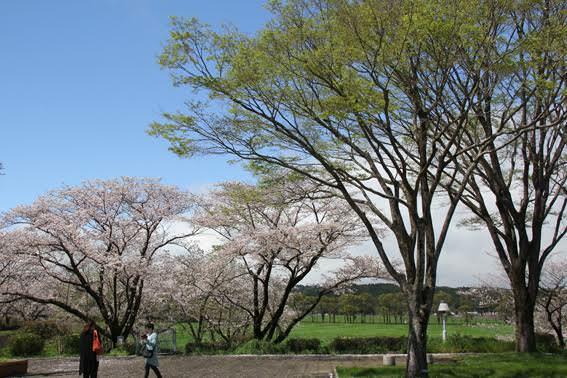 The people more than second make an application for “continuation”. And they are matching with an affected person immediately. 2. Don’t take money or goods from affected people. Tea is O.K. 3. 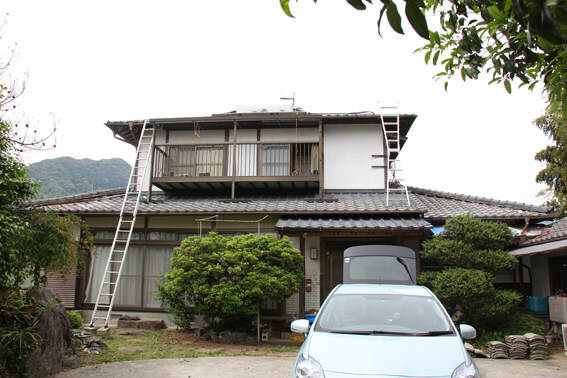 Don’t take dangerous work like climbing the roof top. 4. Take a break for fresh water very often. 5. Finishing your work is until three o’clock and a half in the afternoon. And so on, they are good explanation for new volunteer worker. 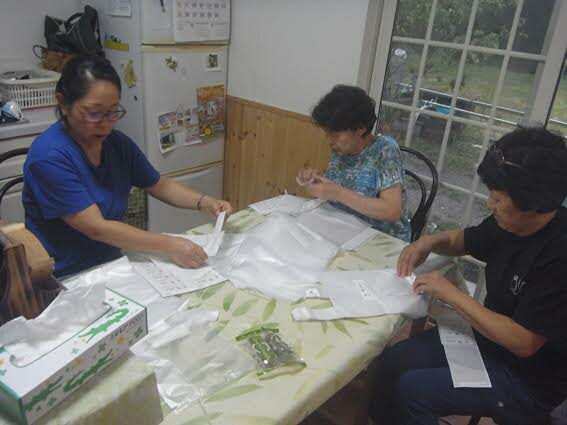 And then, it is matching with an affected person’s request and a volunteer worker. There are three chairs in front of the acceptance desk. One is participation for the public. 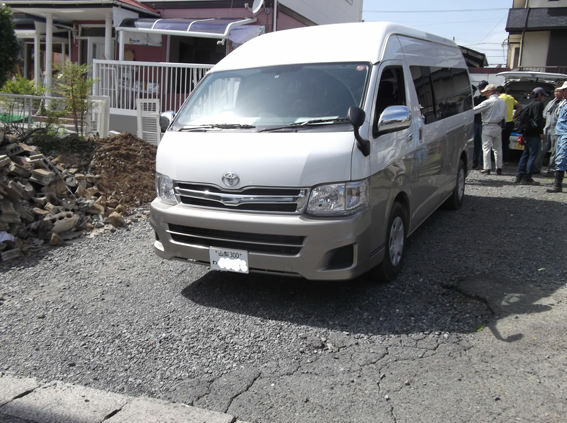 Second is offering the car or the small truck or the truck for voluntary. 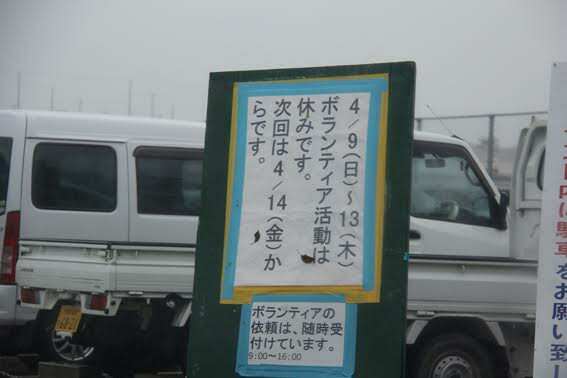 I line up the second because I want go to certain place during the lunch time. 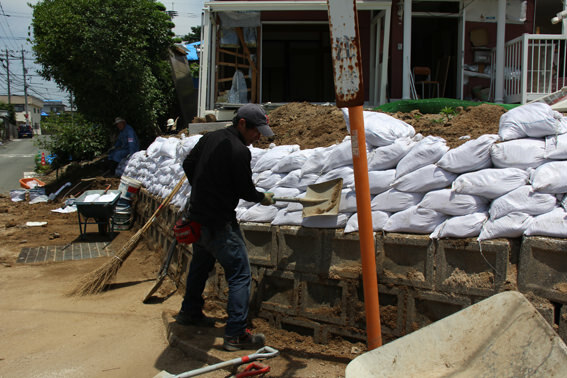 I joined one of the ten people team, and we went to the affected place loading various instruments on the two cars and the small truck. Before starting, we pepped us “take a best” from a team leader’s shout. 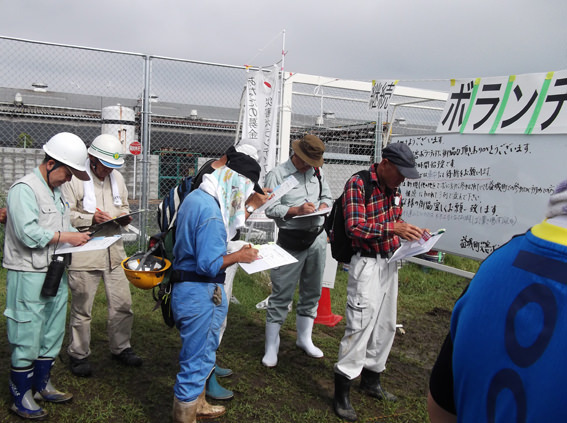 The team leader is a young man in the middle. 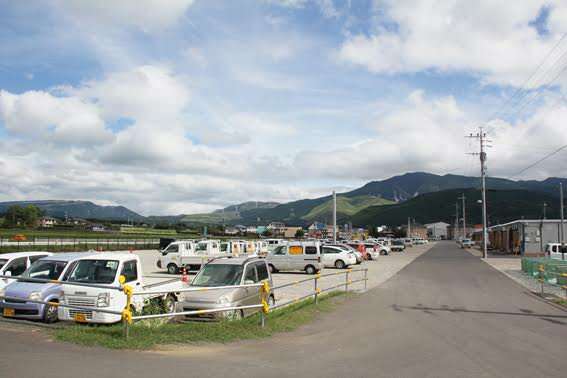 This is a working place around Kiyama I Chome in Masuki town. up. 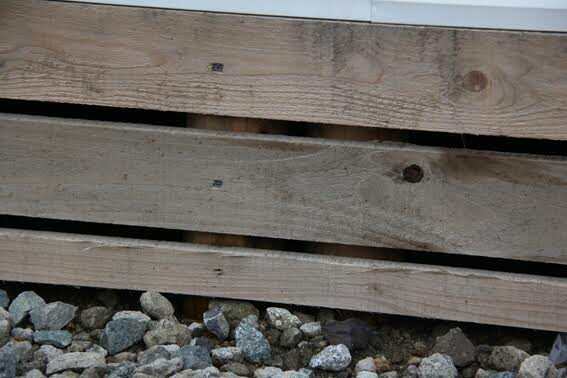 We crushed these small and cut reinforcing rods and we separate them and clear them up. I strolled in the circumference a little for the lunch break. 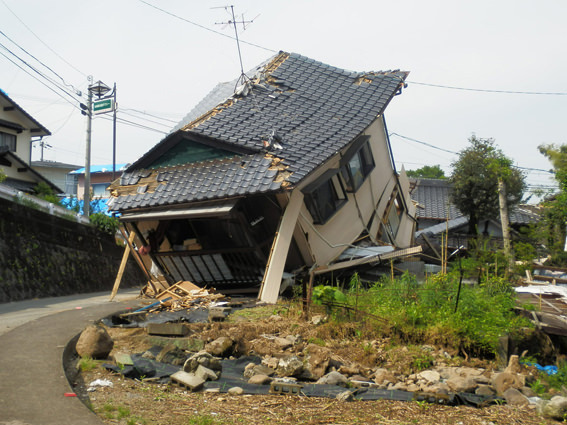 There were a lot of houses broken in this way. 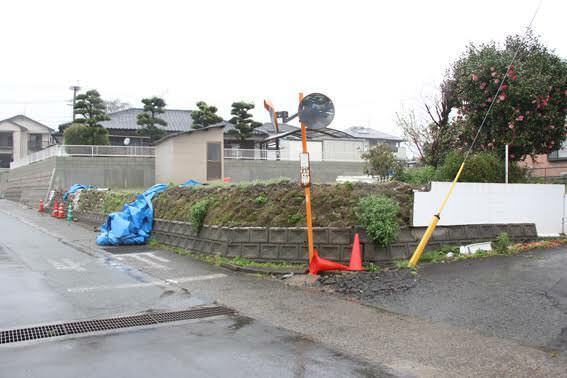 The water pipe was destroyed, too, and there was a fire hydrant for the emergency putting. 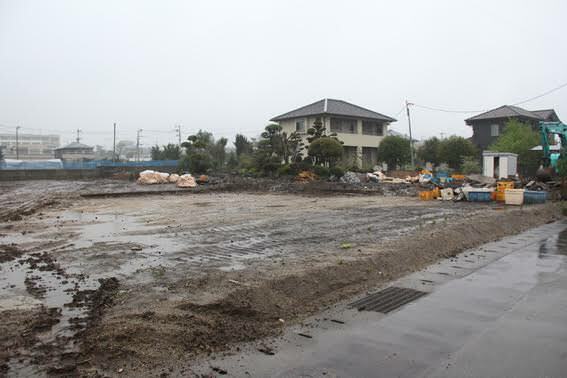 And then I went to the ruins of Kumamoto East Bible Christ Church. 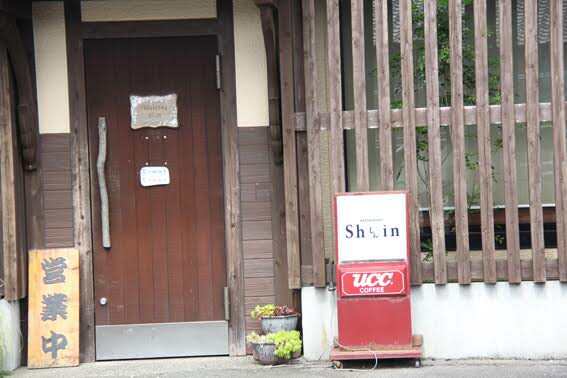 Such a signboard was leaned. The written sentences are as follows. 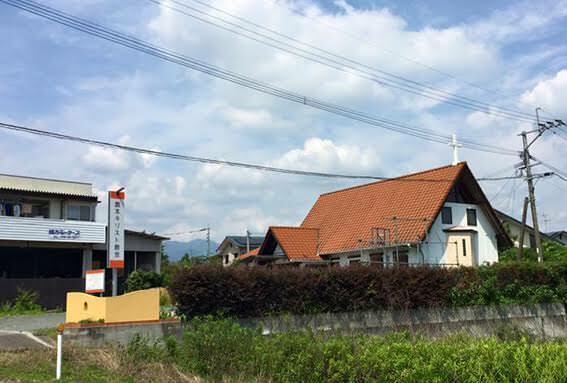 The church is near the Masuki Town Cultural Hall. 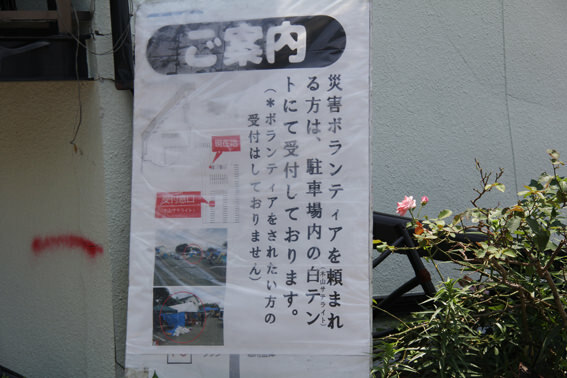 There is a signboard of the volunteer center. 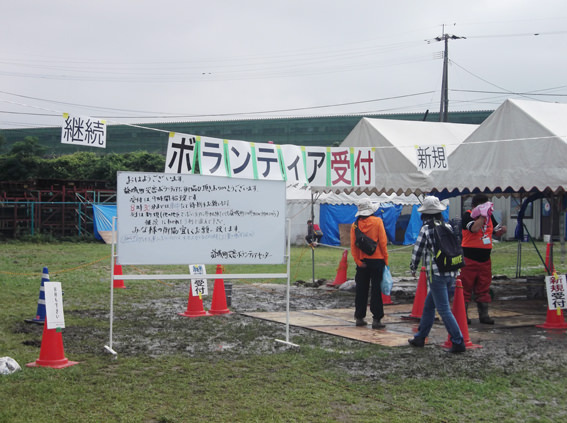 It says that the person asked for a disaster volunteer worker accepts it by the white tent in the parking lot. 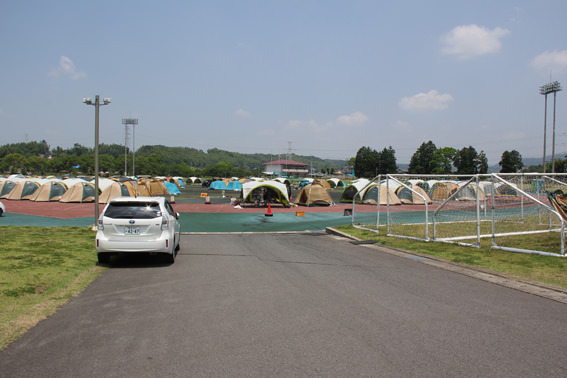 There are tent villages on the ground of Masuki Town General Gymnasium. 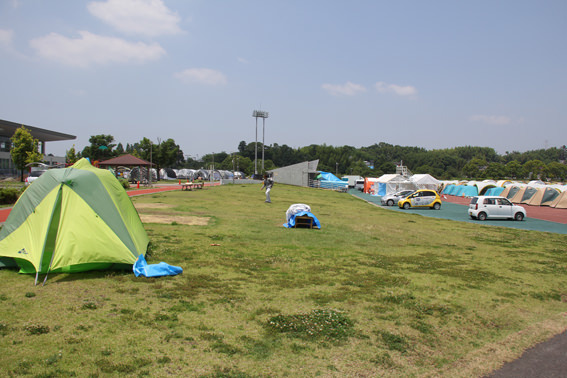 Ken Noguchi who is a mountaineer from Tokyo established these camp grounds. 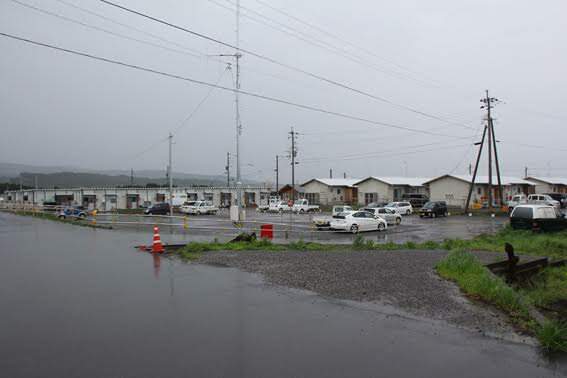 However, Masuki Town Office was only for May 31 and decided closedown. 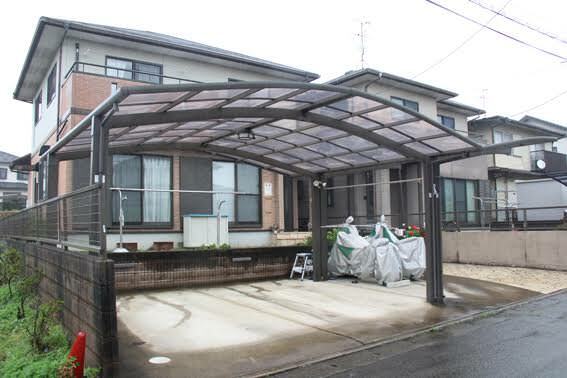 The rainy season comes soon. And they worry about the flooding of the big river nearby. 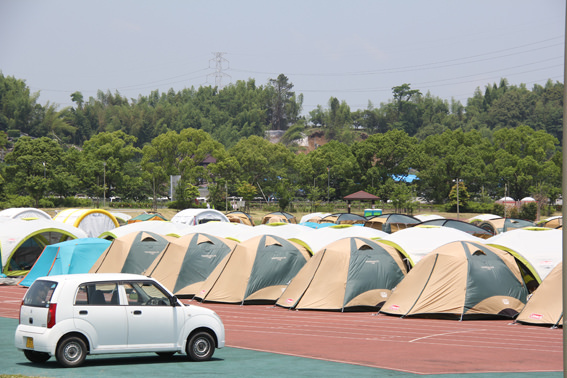 And they also worry about the high temperature in the tent during day time. 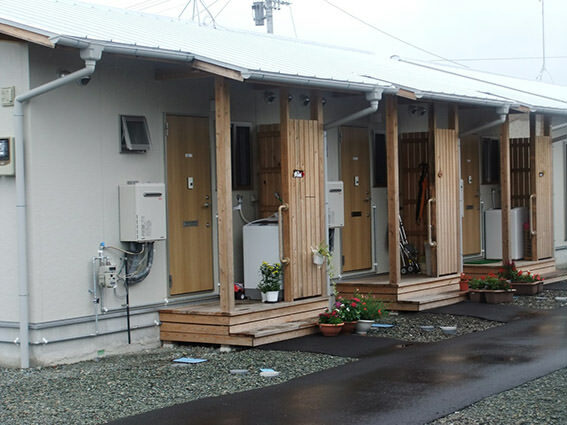 Where will people including children who took shelter go from now on? 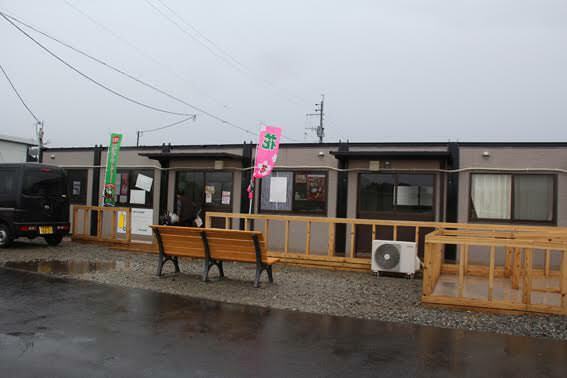 Well, we went to the “Suku Suku Day Nursery” of the district of Tsuji-no-Shiro. 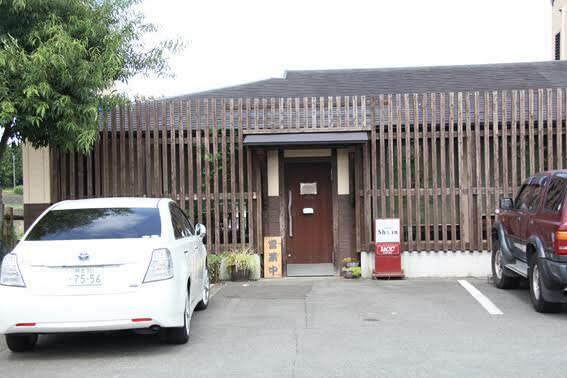 This is a small day nursery. 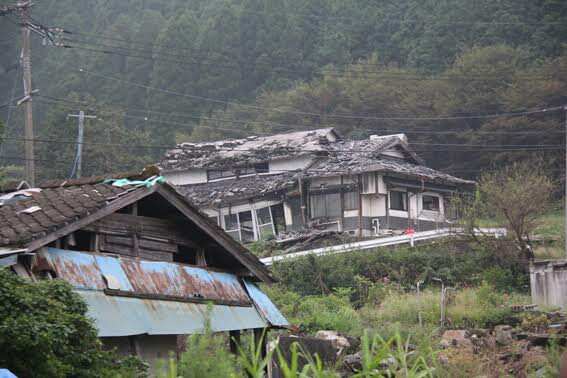 The building seems to work at glance properly. 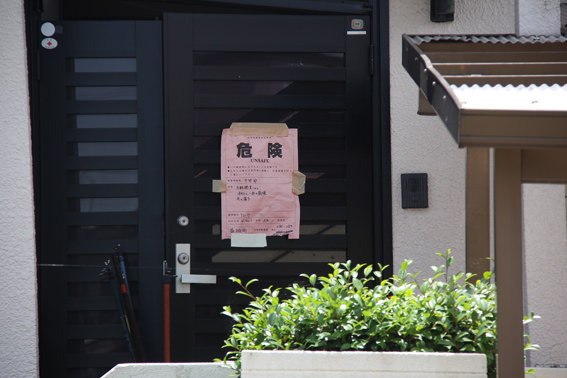 However, many places cracked in a house, and red paper of “the danger” was completed. 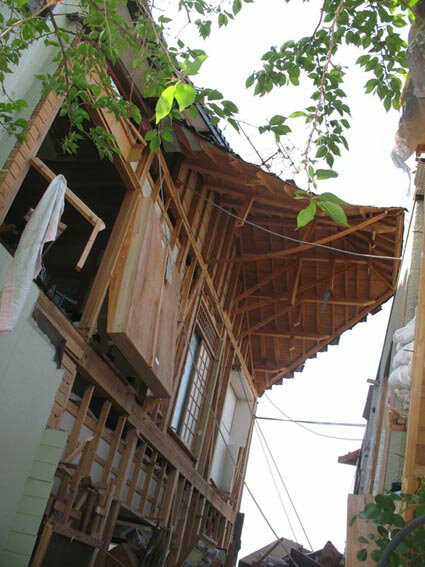 The landlord was said that the house rebuilt it. 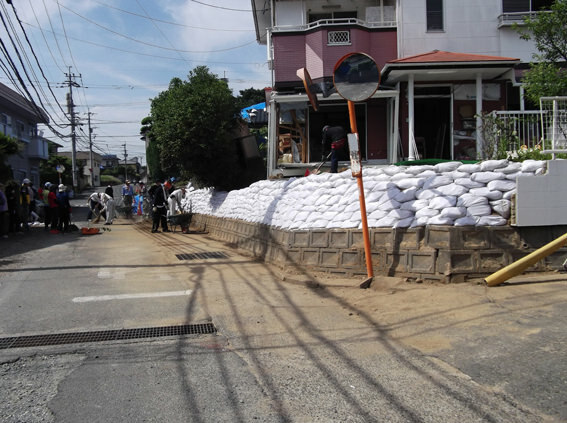 We ten team members collected soil and concrete blocks scattered in the middle of the road. 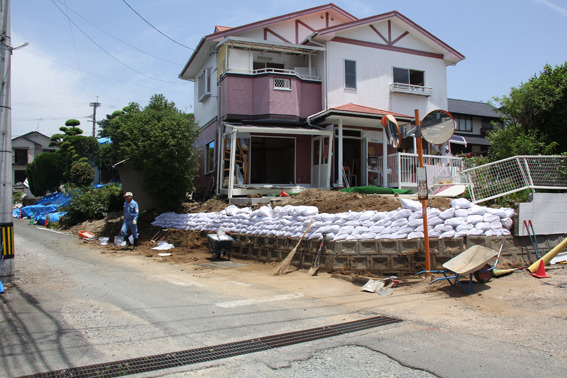 And we separated stones and soil mixed in that, and we put the soil in a pot and piled it up in this way near the building. 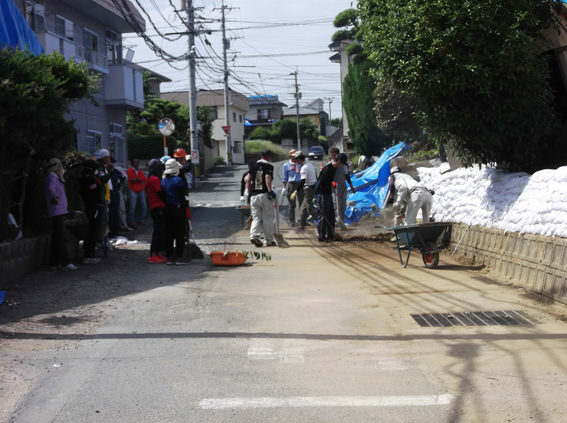 Because the volunteer work was until 3:00, we considerably did our best in the morning, but there was not over anticipating it today. And it was very hot, it was 33C degrees here when measured in a thermometer. 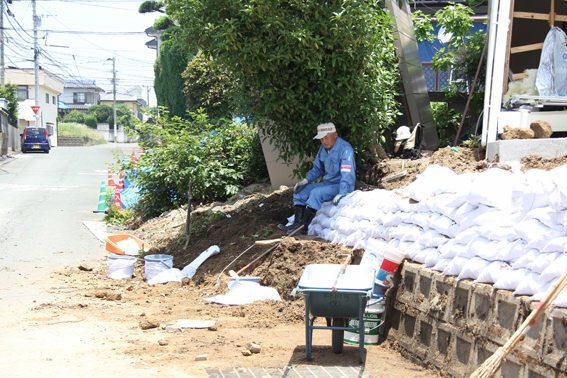 It was very good that the man who came from Osaka piled up soil pots. 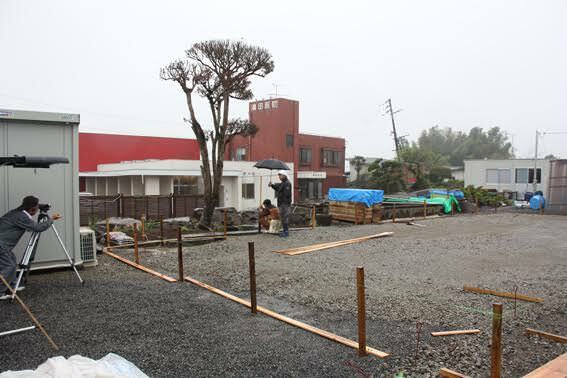 And he knocked on the soil pots which piling up with a square shovel and finished it neatly. 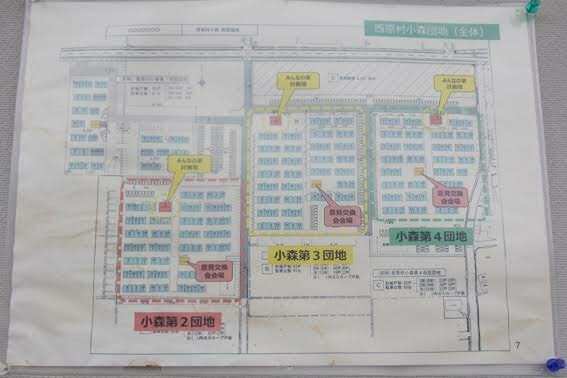 I thought myself, this work to be harder in this heat more and more in the afternoon. 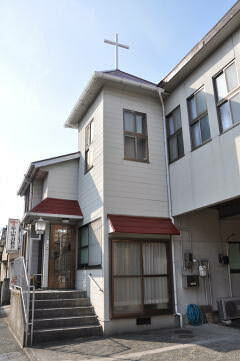 I was thinking so, and a support corps of ten people came over newly. I gave thanksgiving in my heart. Thank you for God. I was saved. Our work is putting in good order quickly. Our work is over. 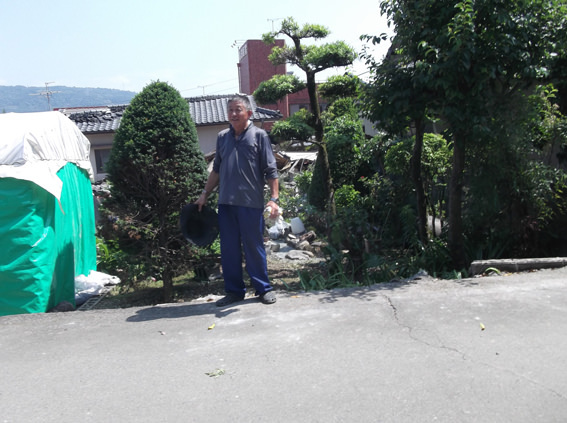 And I asked to cut the trees which interfered by a landlord. 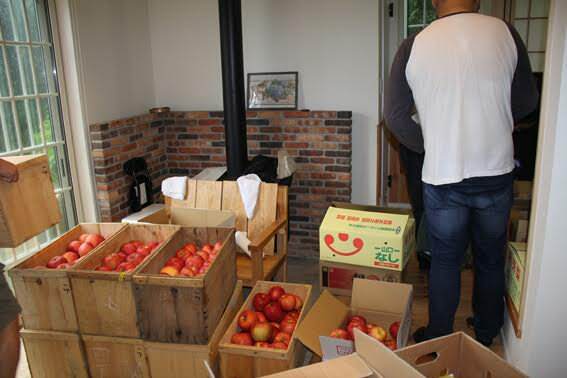 And I cut the trees of persimmon, cumquat, and fragrant olive, and then I cleared them up. 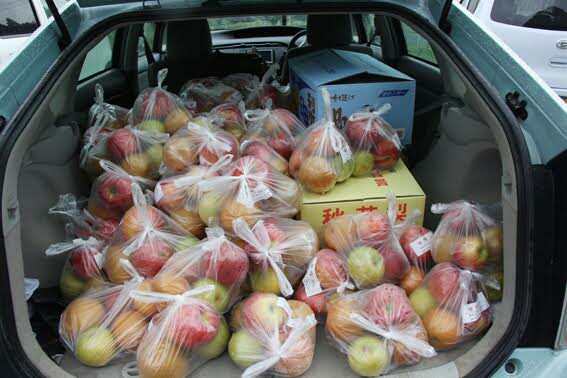 I always put a saw and pruning shares in my car. 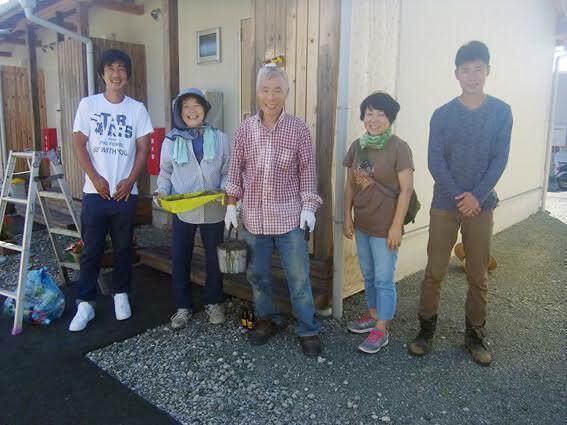 Three youths who came from Kobe to tell to be the repayment of favor because they were take care of Great Hanshin Earthquake. 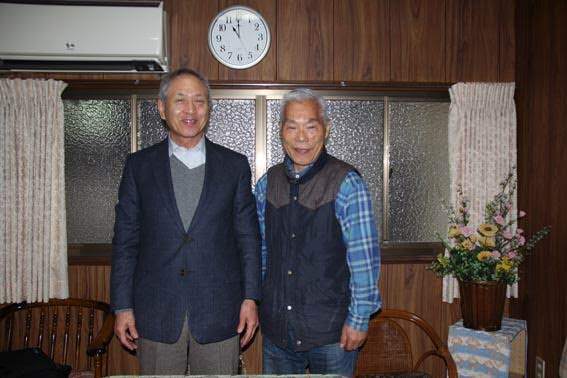 There were two young men who came from Yamanashi. 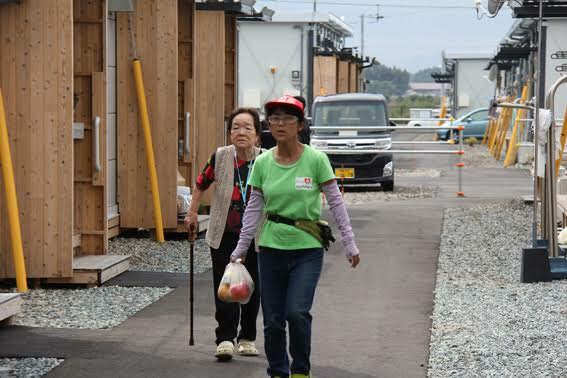 They do volunteer activity for one week or one month while staying a car. Unfortunately I cannot do it like them. 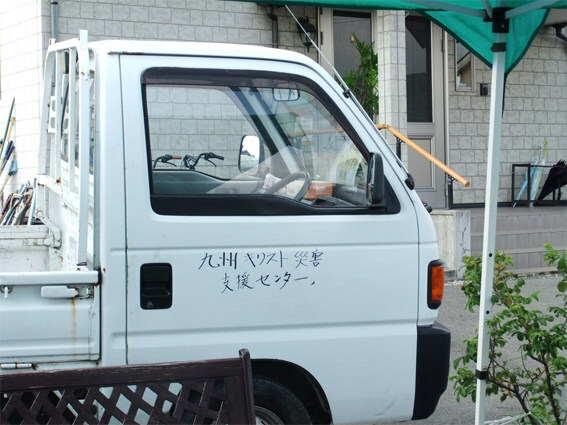 The people who lives in various places at a refuge of victims or there are persons who continues sleeping on their car because there is a child. I pray for the comfort of the Lord. 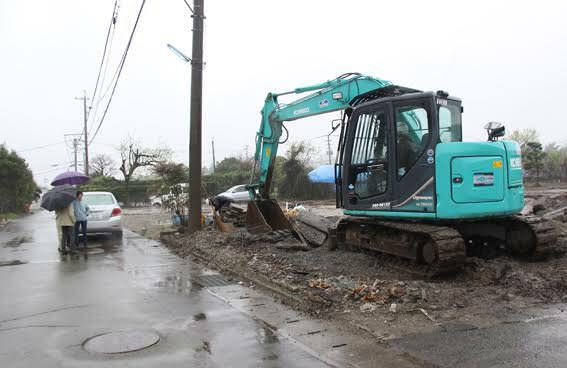 If it is me, the life in the car will be hard. 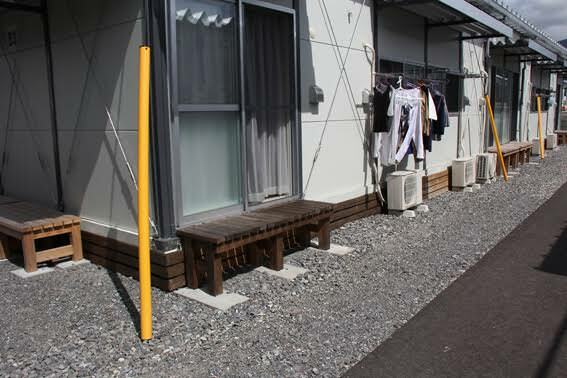 I think that I want to sleep with futon or Japanese bedding properly and I want to take a bath in the hot spring. 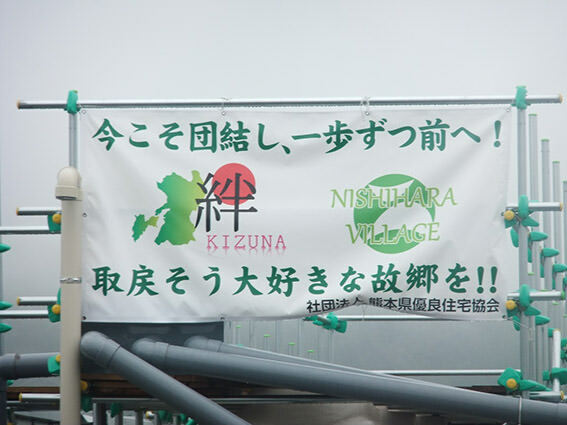 And also my hometown Miyazaki is near from here, and my daughter lives in same Kumamoto. 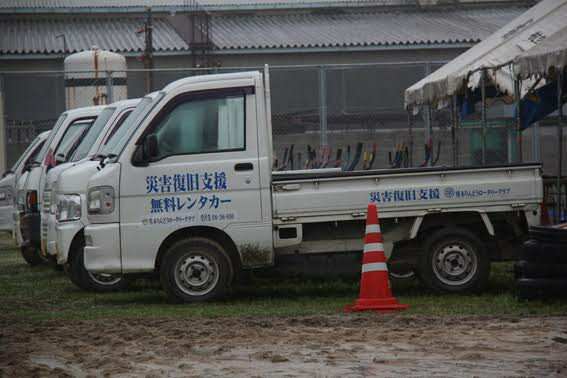 That’s why I can do a volunteer activity. Thanks for God. 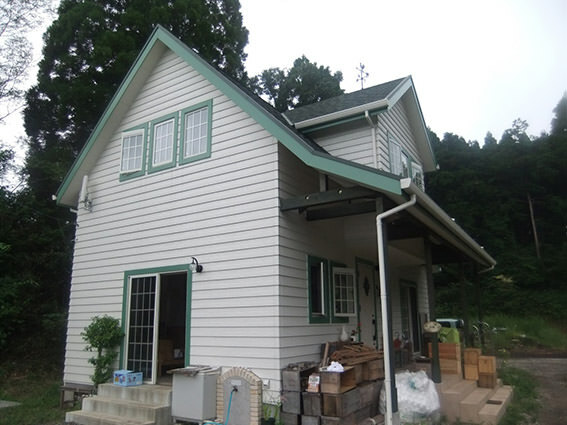 In the opposite house where we worked, nothing seems to fail at a glance. 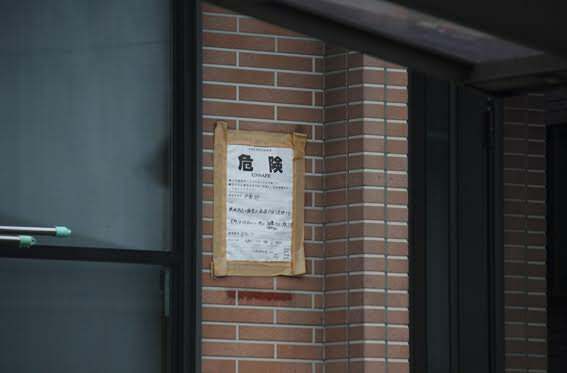 Mobilization notice of the danger was put on the entrance door. 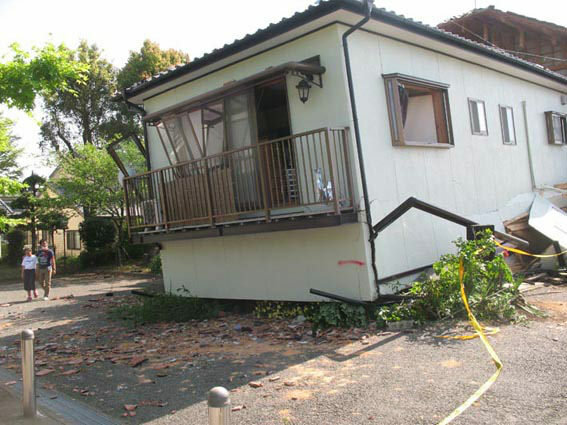 It is to write in front of the broken house. 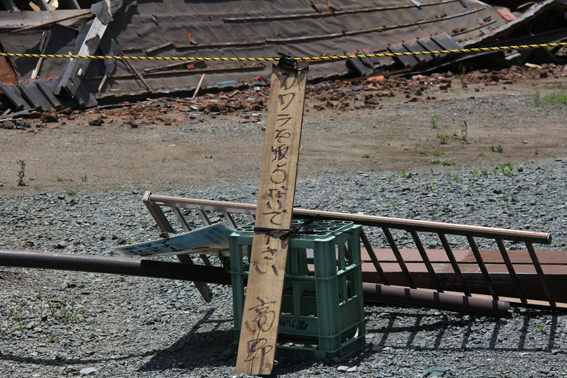 “Don’t steel roof tiles from here”. Someone seemed to steel valuable roof tiles from here in this time. 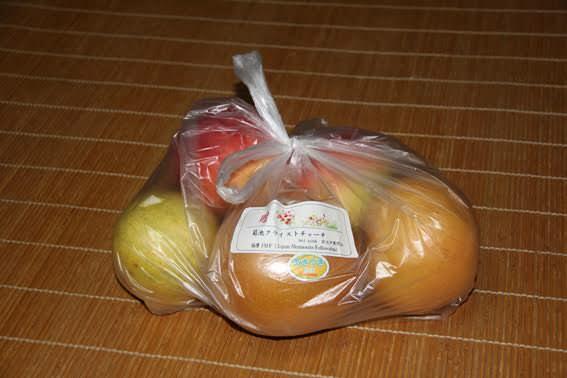 It is an immorality person in this world, isn’t it? 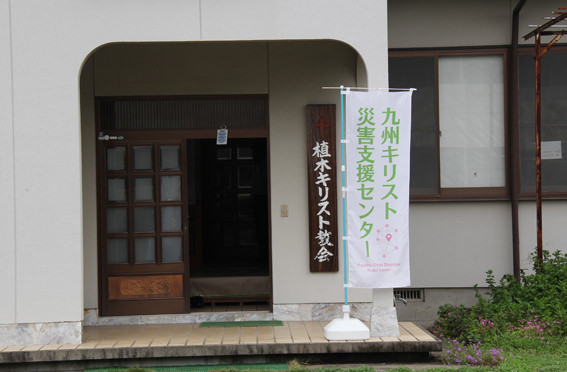 I visited the Kiyama Christ Church during lunch time. 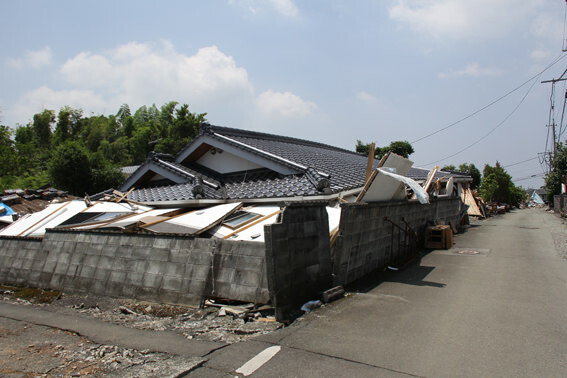 The houses around here damaged greatly, but this church was safe. 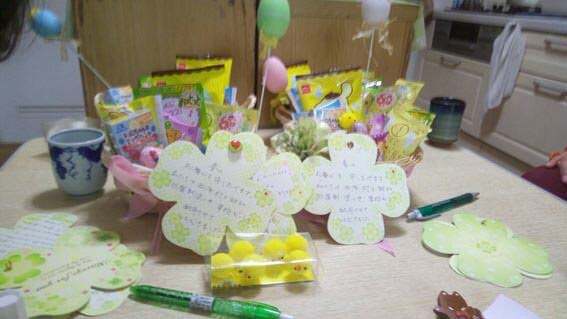 And then, the church members do support activity now. 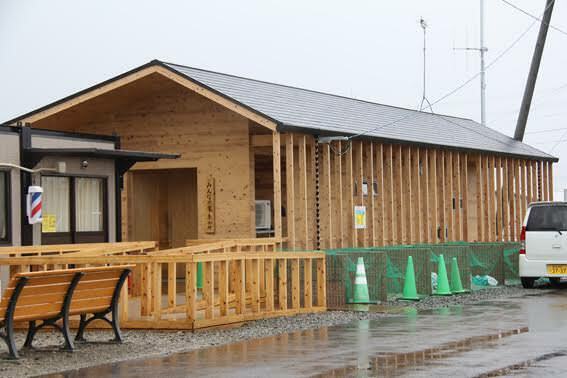 This is one of the bases of Kyushu Christ Church Disaster Support Center. Here is also acceptance for victims and for volunteers. 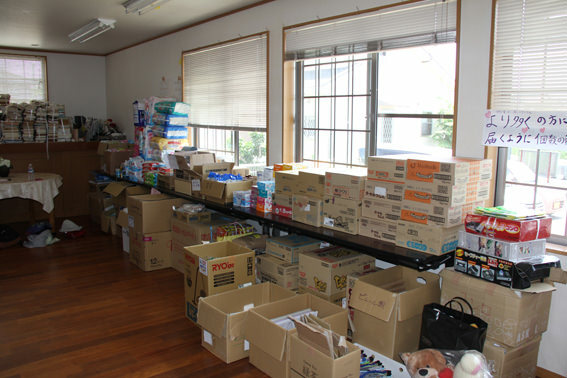 A lot of support goods are piling up in this room. 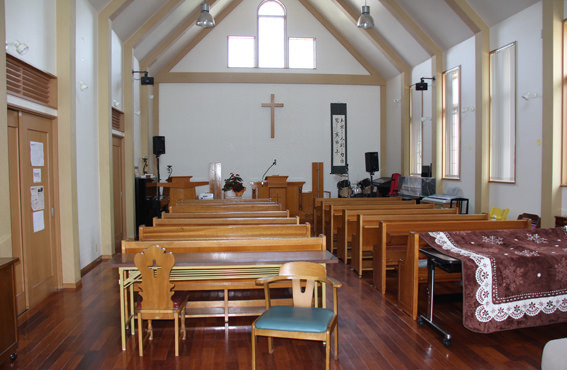 This is a worship room or a chapel. 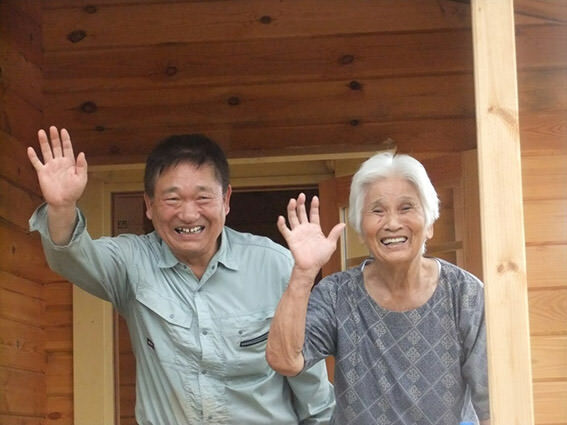 This photo is Pastor Mayumi Oda and me. 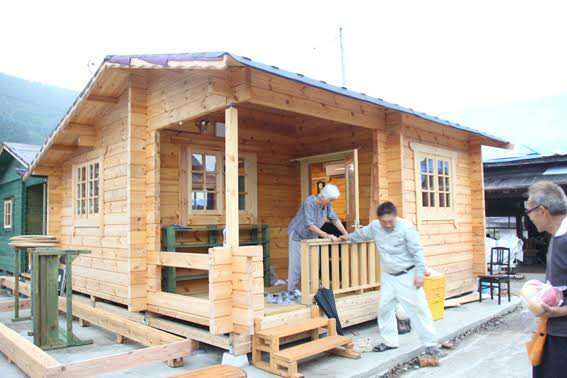 Will you go to Kumamoto, and do volunteer work? We are waiting for your volunteer proposal. 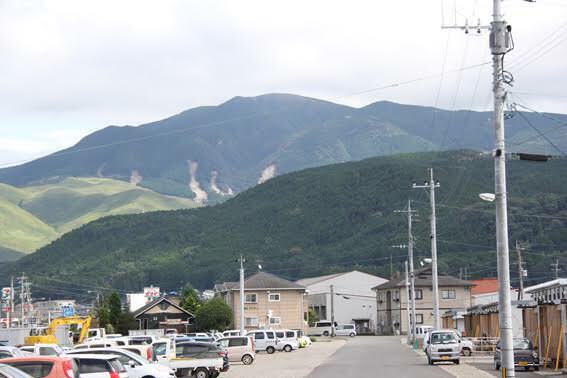 We left Hyuga in the morning on May 2, and through Takachiho, Takakmori, Minami-Aso, Nishihara village and entered Kumamoto city. 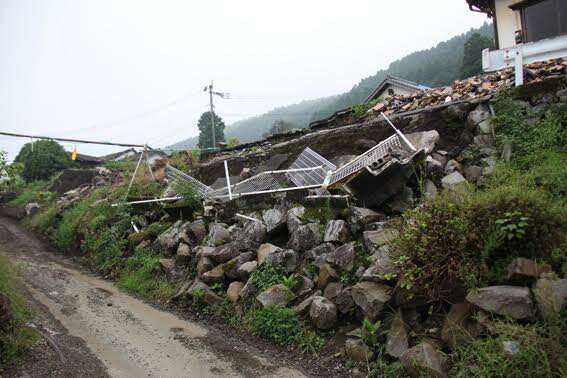 A road cracked, and big stones rolled by the Minami-Aso mountain path here and there. 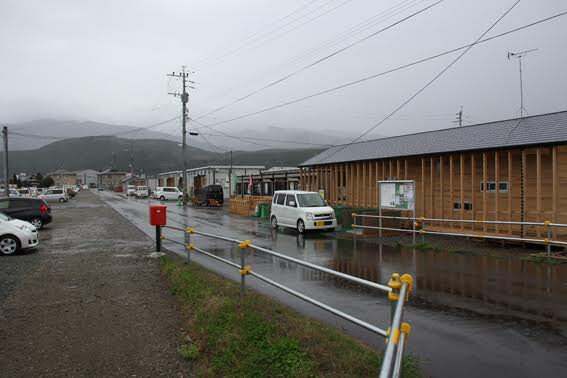 Scenery changed completely when we entered the Nishihara village, and there was the house which collapsed of a building and the wall made blocks of partial destruction, and the blue seats of the rain-cover was outstanding. 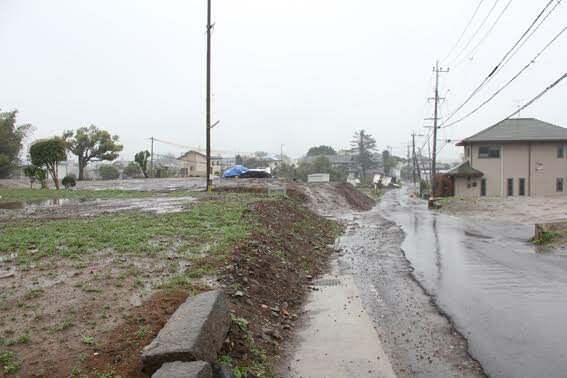 I did the state in Kumamoto city as far as I saw it, but there seemed to be little damage of the buildings. 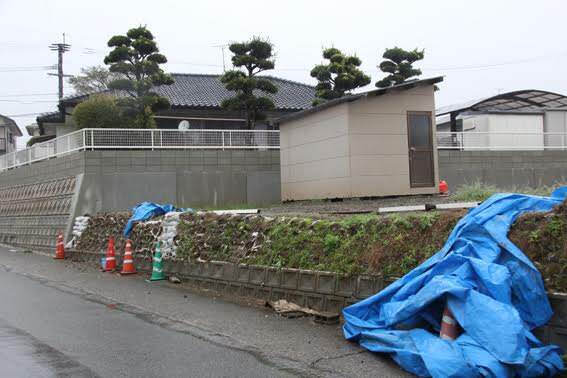 However, the outer wall of buildings fell everywhere, and a floor tile came off, and many piece of furniture which was not usable was loaded onto the road side, and I felt the scar of the big earthquake with my mind. 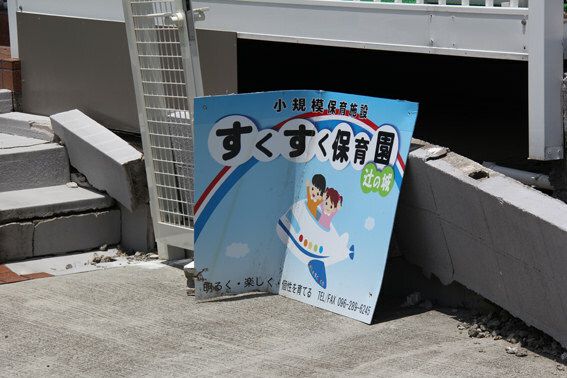 The castle tower of Kumamoto castle fell down by this earthquake, and most of castle walls have collapsed. 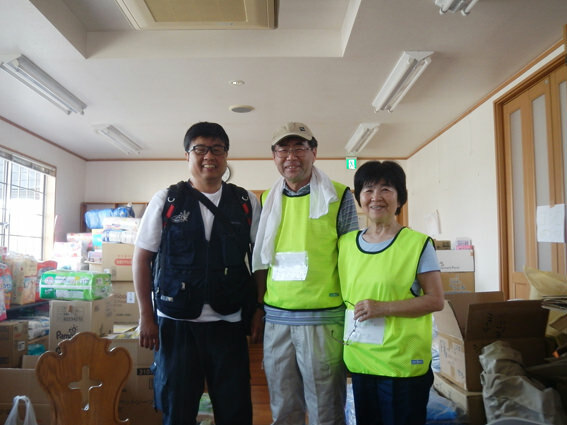 In the Kumamoto YMCA Center nearby, we finished the acceptance of volunteer work and the staying at night, and then we moved to Kumamoto Harvest Church, which is Kumamoto branch of Kyushu Christ Disaster Center and representative is Pastor Yoji Nakamura. 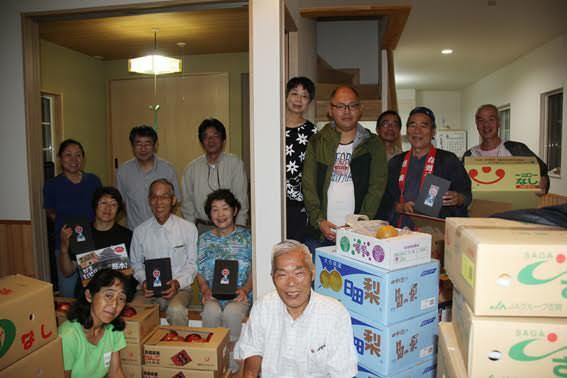 This is the disaster center office and a lot of relief goods from various places were heaped up, and some staff members who dispatched by Japan International Food for the Hungry (JIFH) made it busy to correspond to the volunteer workers came from various places. 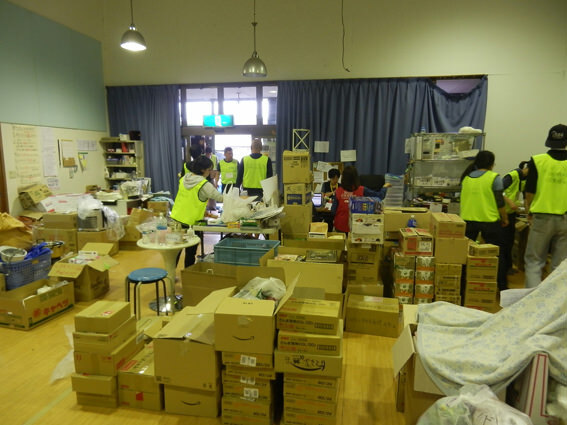 We moved to the Kiyama Christ Church which is another disaster center from here again. 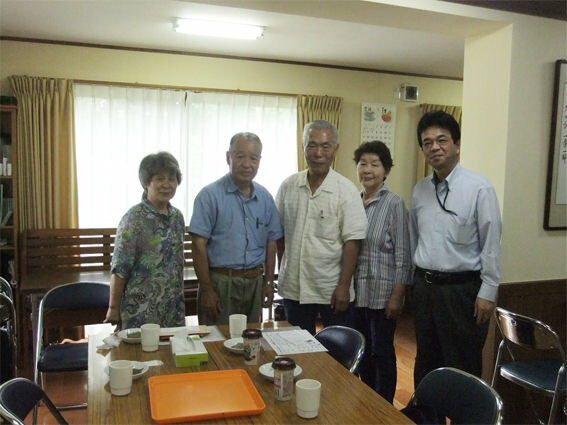 I was surprised that I was identified as the graduate of what same theological college while I talked with Pastor Mayumi Oda of the church. 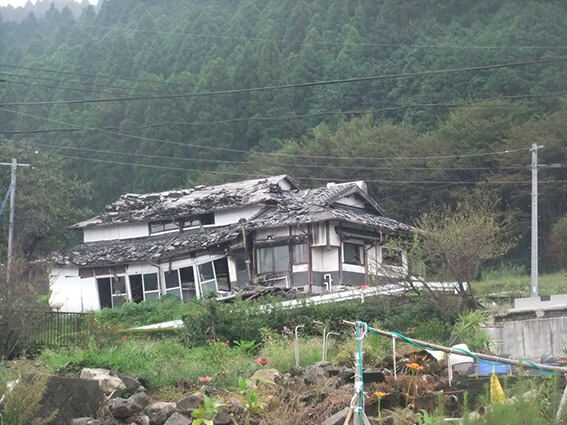 It was the church in the Masuki town where damage was the heaviest by this earthquake here. 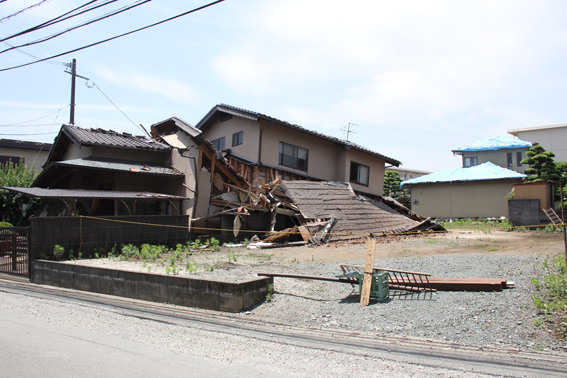 The building of this church was all right but the buildings the neighborhood were a state of partial destruction and the complete destruction. 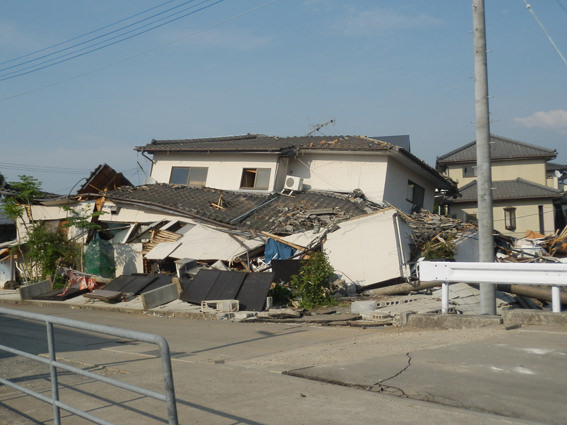 Although we saw seriousness of the damage of this town on TV and knew it, but we came to here and saw it with my naked eyes directly and realized the terror of the earthquake. 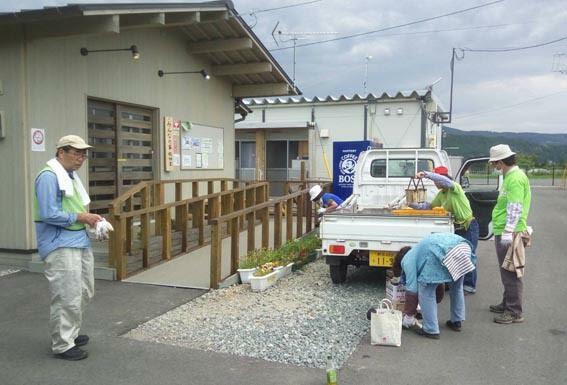 We went to four refuges; Aijien Kindergarten, Hiroyasu-Nishi Elementary School, Iino Elementary School and Ikoino-Sato nursing home for the aged; in response to a request of the staff here. 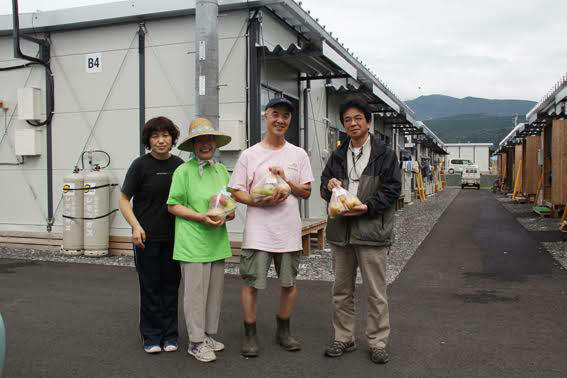 The purpose was to hear needs of the distribution of boiled rice at the refuge. 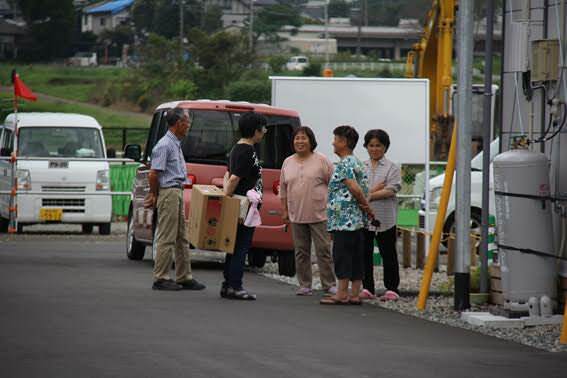 There were q place where beginning to cook it to people of neighborhood where other volunteer party had already done distribution of boiled rice. 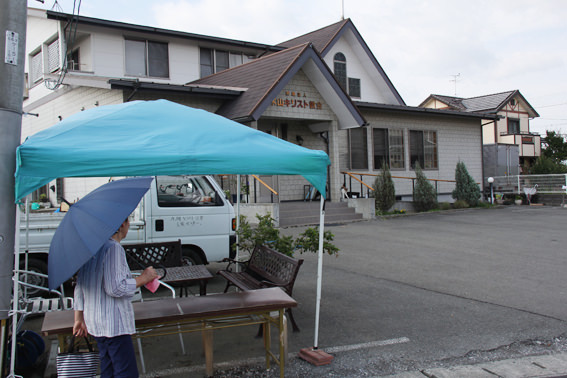 Only “Ikoino-Sato old people’s home” applied for our distribution of boiled rice after all. 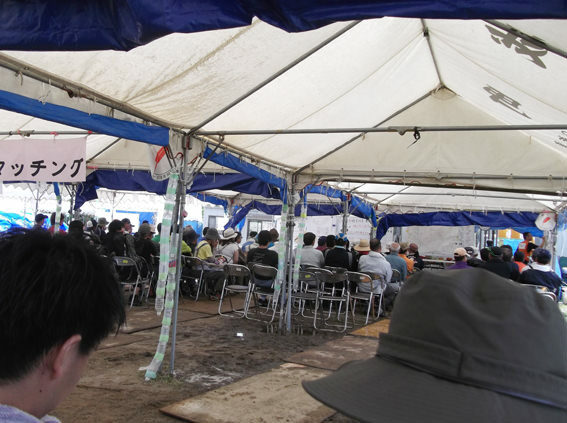 We thanked the Lord when it was good to go round several places of refuges. 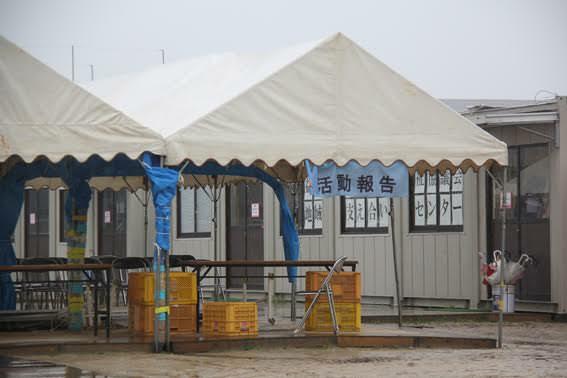 There is a Takoyaki tent on the ground of Hiroyasu-Nishi Elementary School. 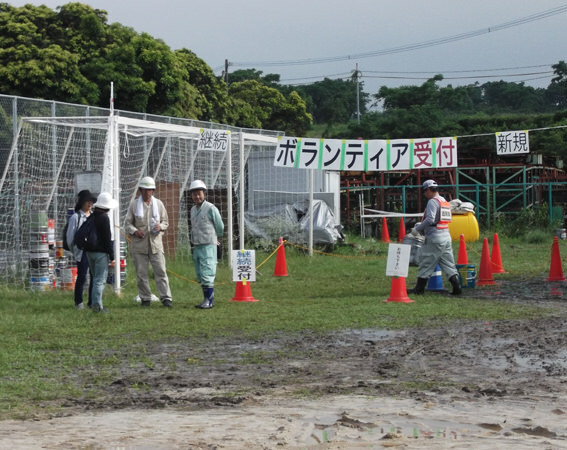 Takoyaki volunteer, they acted bravely Takoyaki on the people of the affected people. 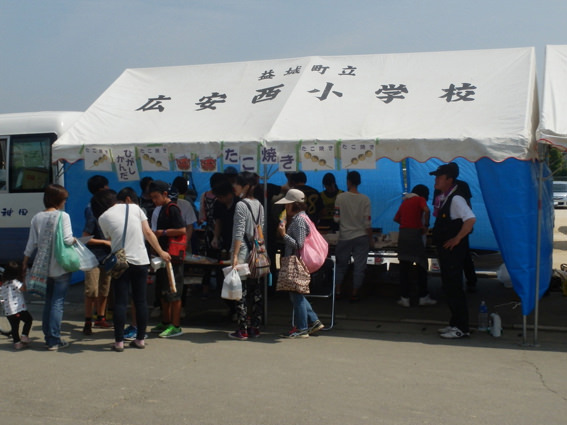 We became glad to see children who evacuated ate Takoyaki joyfully, too. ※Takoyaki is a ball-shaped Japanese snack made of a wheat flour – based batter and cooked in a special molded-pan. 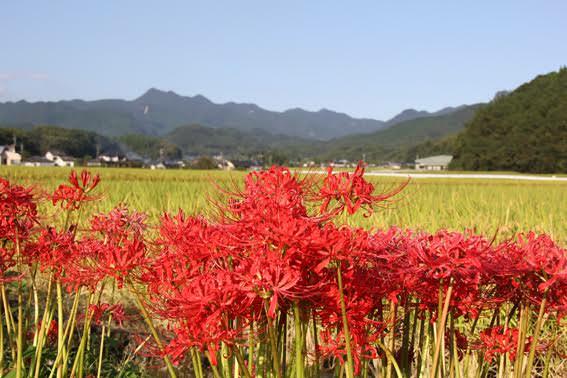 It is typically filed with minced or diced octopus, tempura scraps, pickled ginger, and green onion. 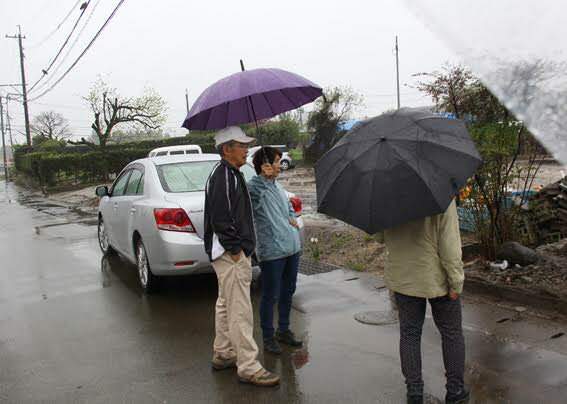 On May 3 of the second day, I went Aso area and refuge “Tanpopo-No-House” of Nishihara village in intense rain by the team of six people. It took about an hour. 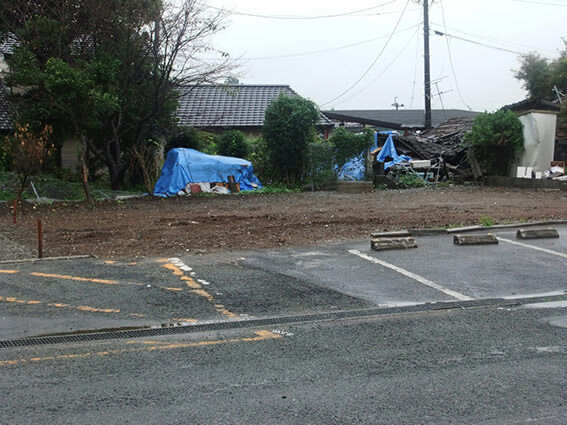 This area suffered big damage here in the place where we went once, too. 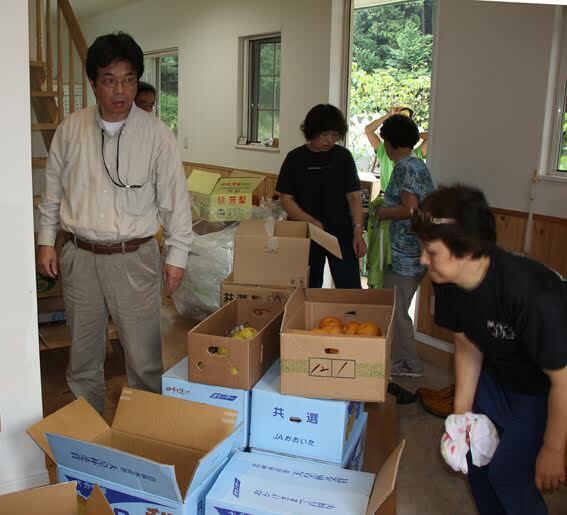 I was to help with the distribution of boiled rice here, but there was slip-up of the communication and did the movement of relief supplies loaded on to the room not a help of distribution of boiled rice and putting in order of the corrugated cardboard. 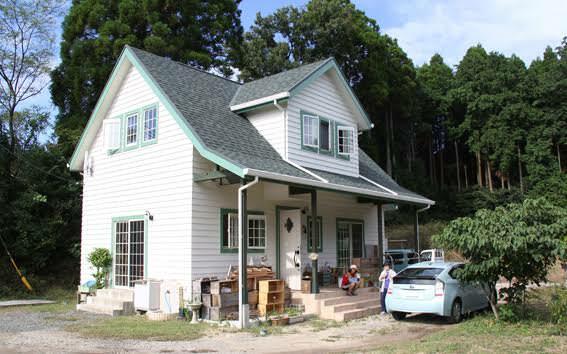 My wife Yoko stayed in the Kumamoto YMCA, and she did reception clerk for volunteer workers who came over here with a missionary. 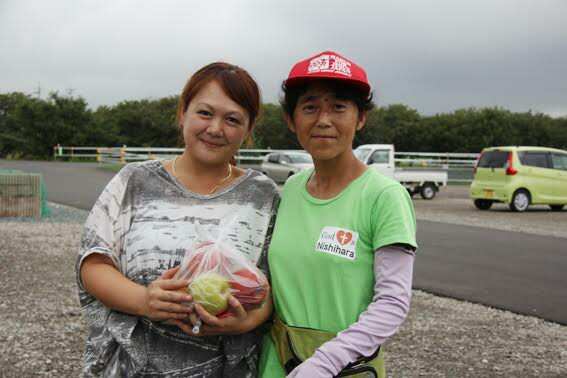 Because volunteer people increased at once in consecutive holidays, it took her work from morning to evening. 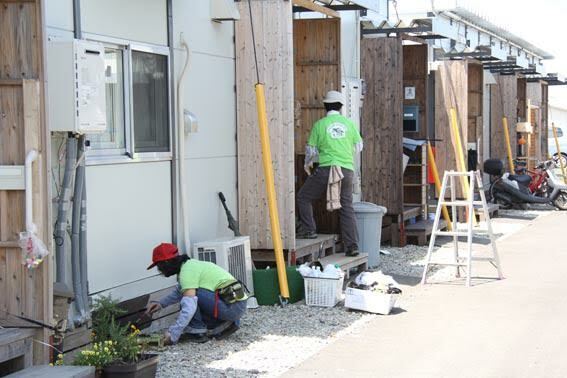 As for volunteer workers, various volunteer teams came from Singapore, South Korea, Waikiki of Hawaii, and each place of Japan this time. It was a big blessing and it was thank to have come by volunteer activity with them as the Christian who we believe in God and lives for love of Christ. While thanking for the prayer of all of you …　…. 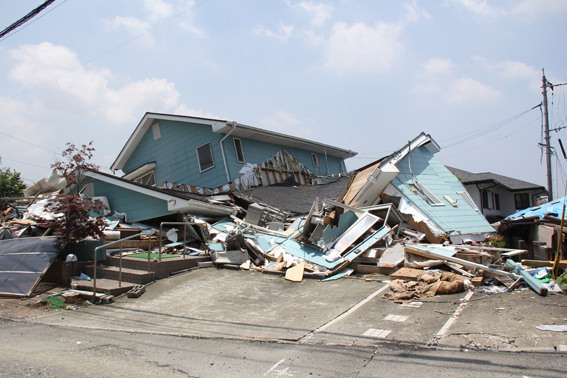 A major earthquake that magnitude 6.5, or the biggest seismic intensity of 7 were generated assuming Kumamoto region cause at 21:26 on April 14, 2016. 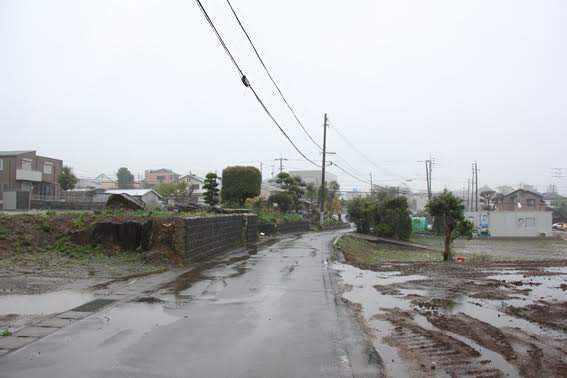 An intense earthquake with a seismic intense of 7 to be said to be “a main shock” at 1:56 on the early morning of April 16 was generated. 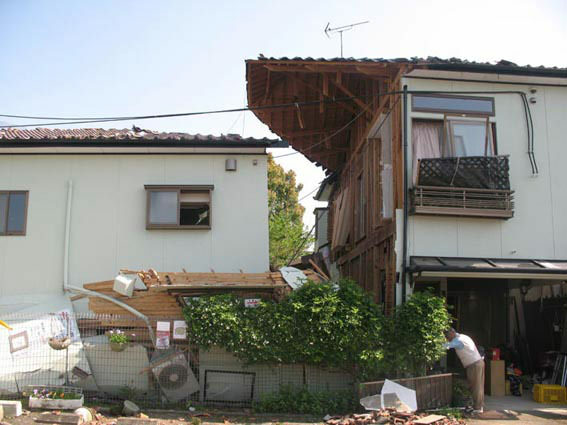 Most houses which were barely standing while getting a blow by the first earthquake, but they were collapsed by this main shock. 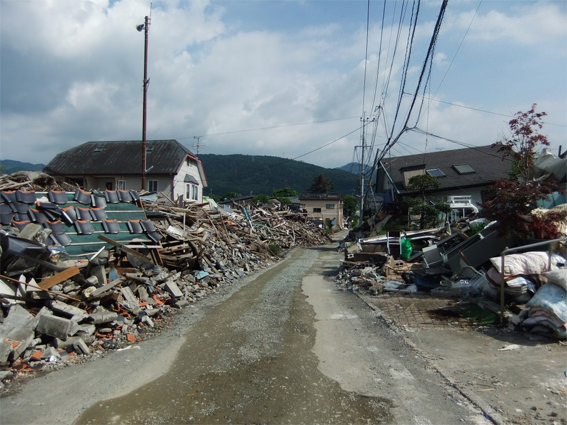 1,200 times of after earthquakes exceed it intermittently afterwards. 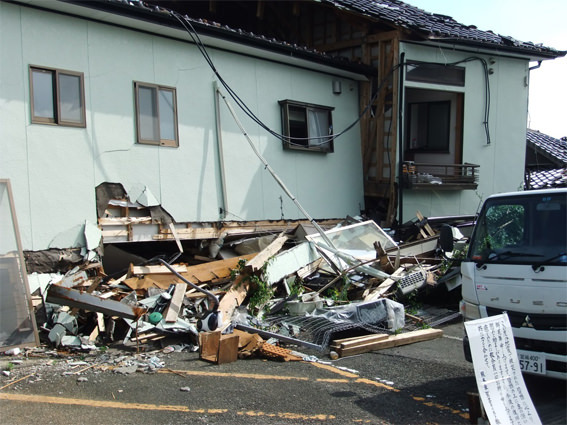 As of April 26, the dead person more than 60 and a large number of injured people appear including allied death by a series of earthquakes from a beginning in Kumamoto prefecture. 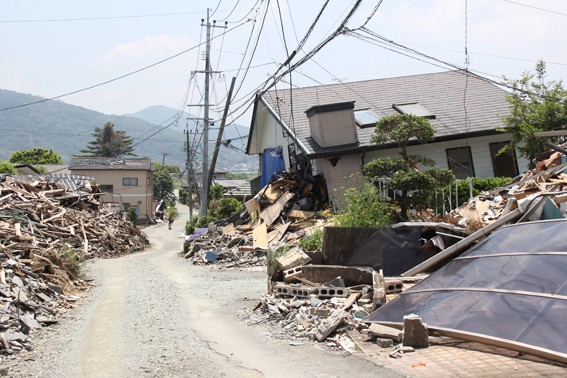 As you know, the damage spreads through a part of the neighboring prefectures, Oita and Miyazaki. 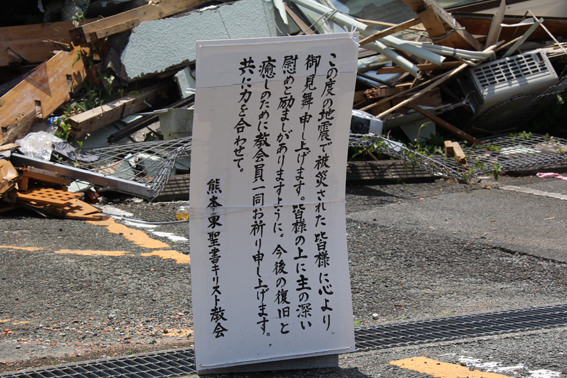 And it is in condition to be able to predict when the earthquake converges. 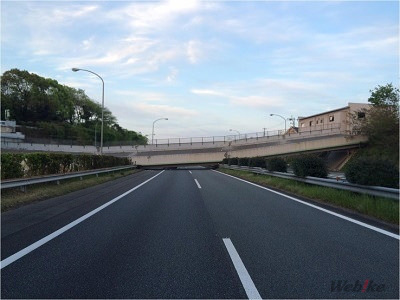 In Kumamoto prefecture, under the influence of earthquakes, the Shinkansen train stopped, the expressway was closed to traffic, and because distribution was delayed, necessities including perishable decreased in the supermarket at one time. 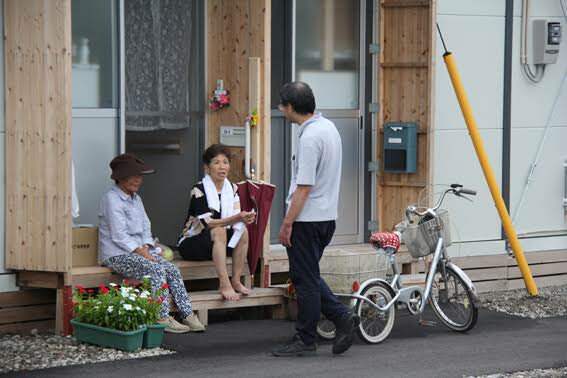 Life as an evacuee is still forced to more than 20,000 people. 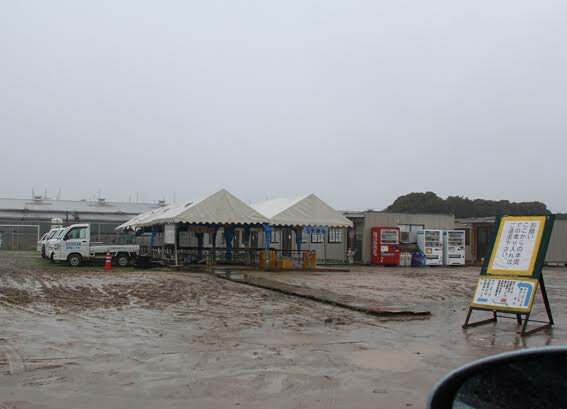 And there is the place where water supply, electricity and gas stop. 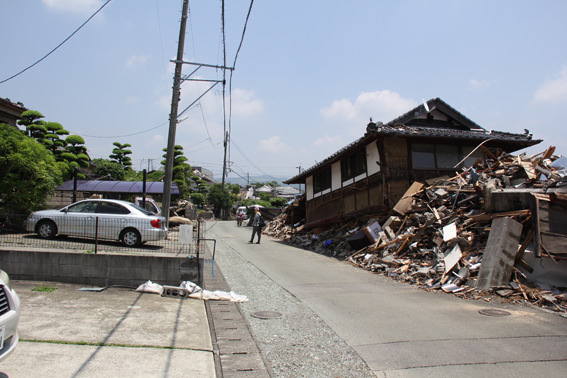 By the church relations, there are cathedrals or church buildings and the personages or pastor’s houses which suffered from earthquakes in Aso city, Kumamoto city, Uki city, and the Masuki town. 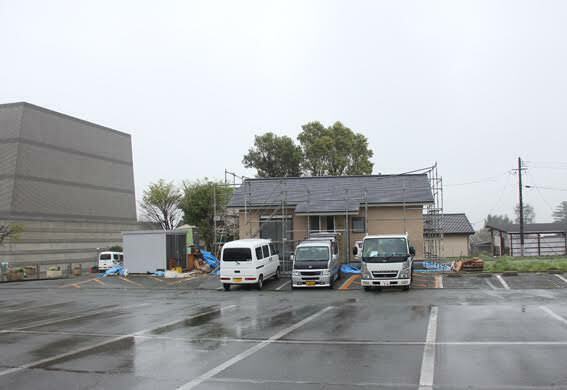 The following is a report of April 15 of the pastor Jzumi Haraguchi of the Kamoto Christ Church living in the Yamaga city. 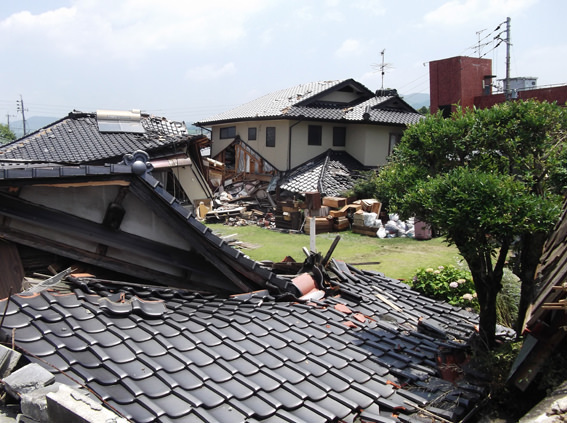 I went to Kumamoto Higashi Bible Christ Church and saw the damage state. 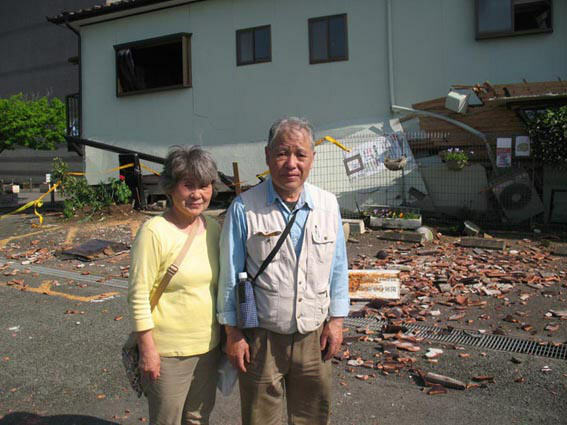 I was able to just meet Mr. and Mrs. Takeshi Toyose in the scene of the disaster. Pastor Toyose and his wife were very tired, but they were safe. 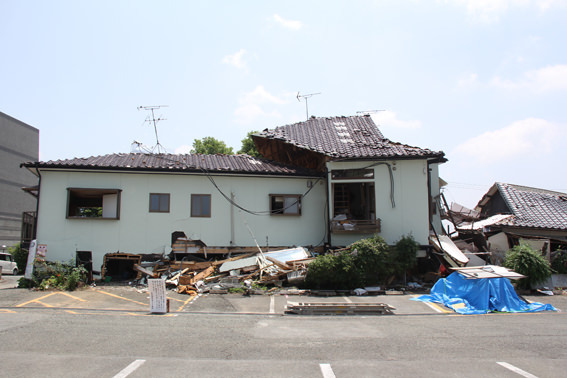 The damaged buildings are the next pictures. 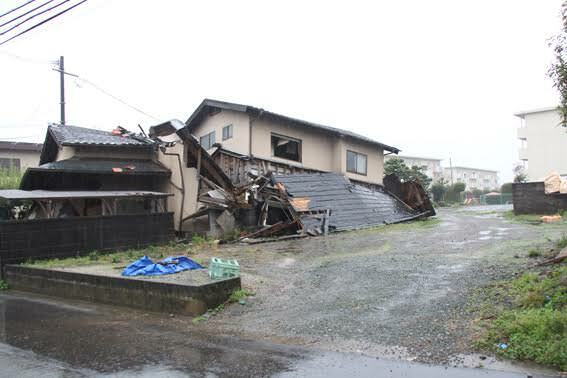 It was a building of the Higashi Church that was the most terrible by the damage of the buildings as far as I saw it in the scene of the disaster. 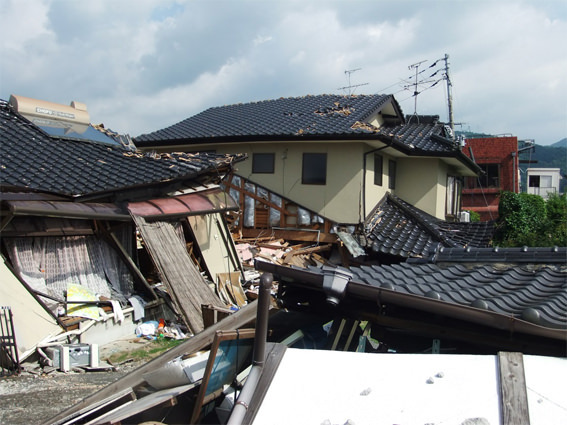 There were the damaged houses such as the broken old shed, and falling walls, and some of the roof tiles, and the walls made of blocks were destroyed in everywhere. 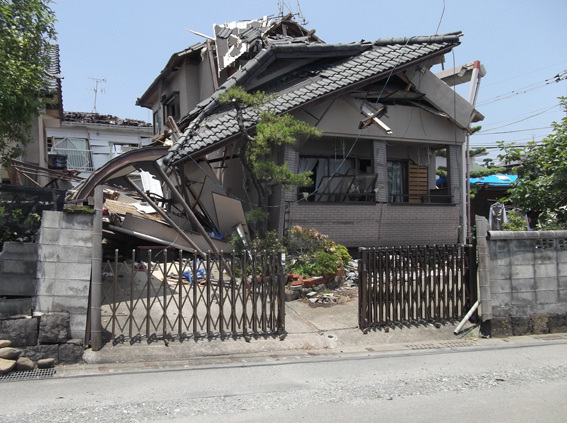 But the Higashi Church suffered the biggest damage in comparison with them. 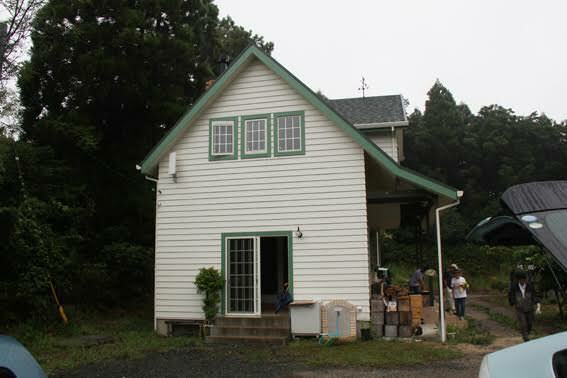 The building of the Higashi Church was used the first floor at two stories as a church. 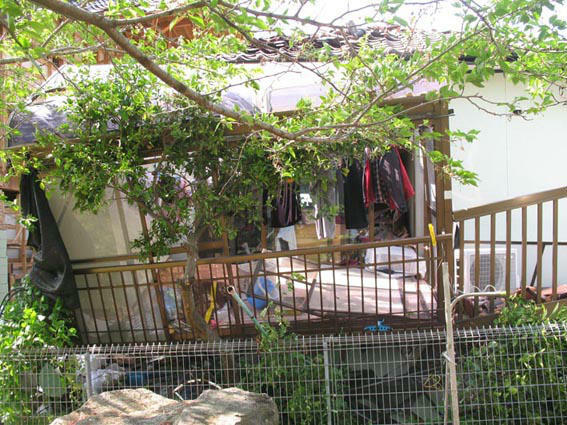 A different family lived in the second floor. 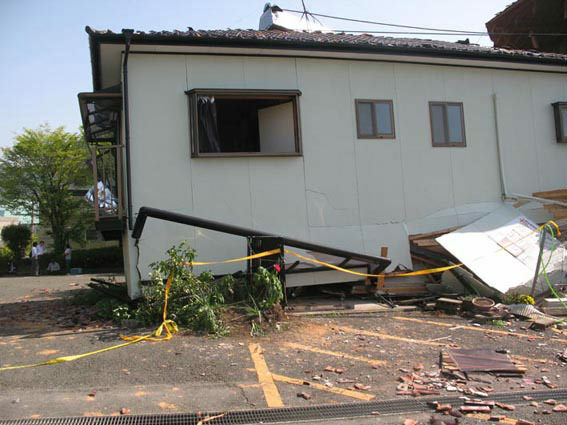 Pastor Toyose and his wife got out the creep from the back of first floor in the broken building. 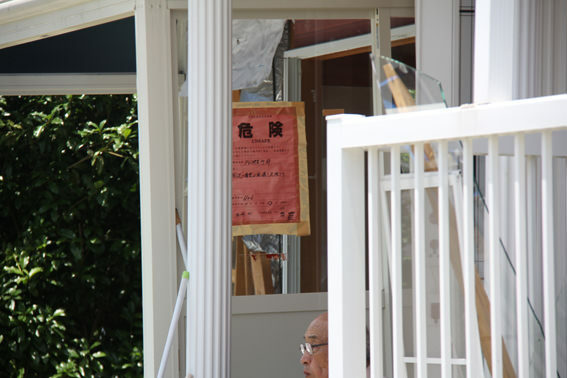 But their daughter Mifumi San could not get out it because she was crushed under the door of the bathroom and a hand was caught in it. She did not seem to be able to move for a posture sitting straight. 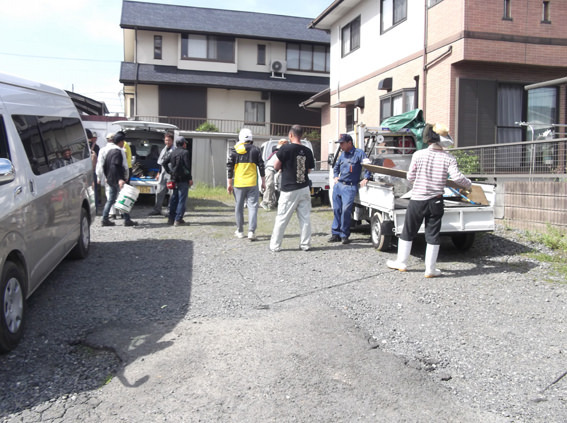 A rescue team rushed, and she was rescued five hours after an earthquake occurrence. 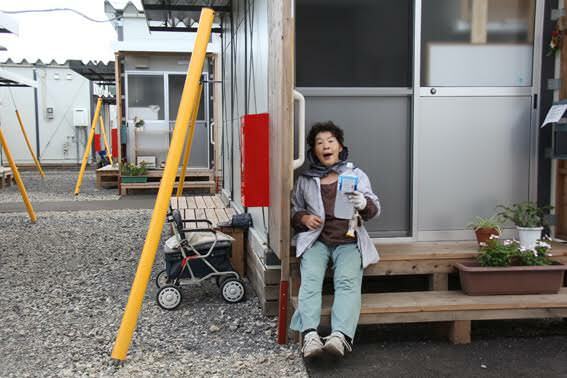 She was treated in Japan Red Cross Hospital then. 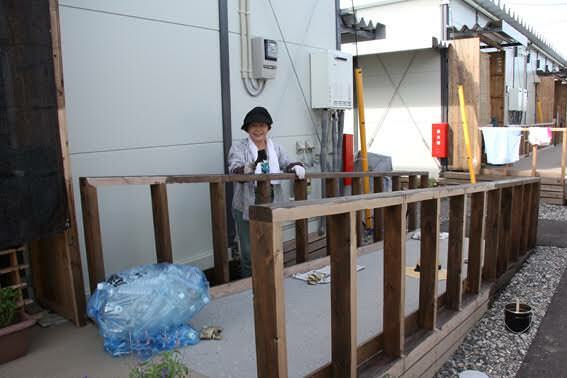 I heard that she seemed to be able to leave the hospital without a bone fracture within one week. 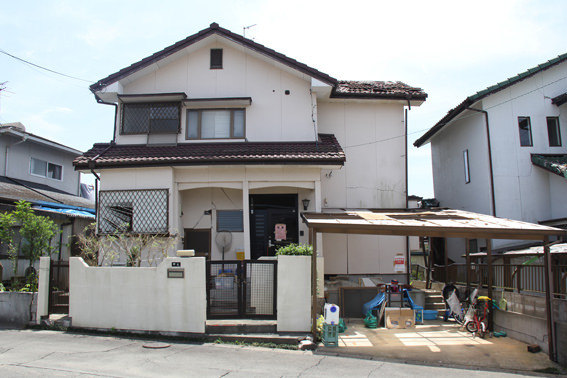 The doctor is expected, and after effects are not to stay, too. Mr. and Mrs. Toyose said that they did not know where they stay at night. 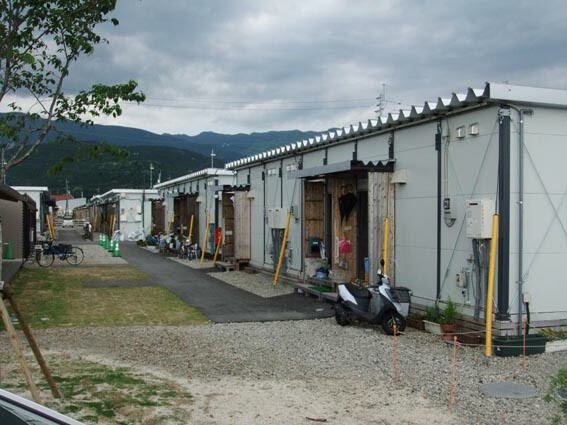 Maybe they could stay at night in the hospital with their daughter, or Masuki Cultural Center of the refuge, or eldest son’s house in the Kumamoto city, or Kumamoto Kita Bible Christ Church. 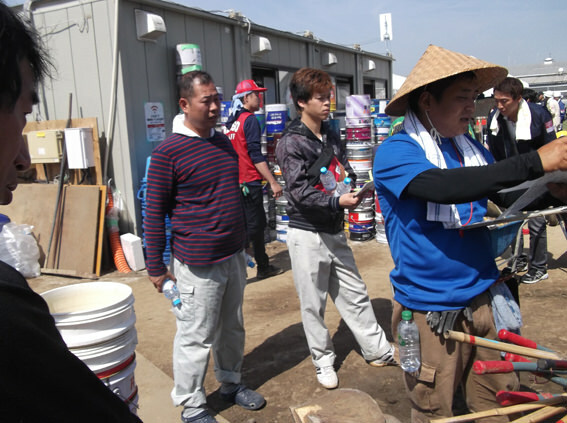 Their two sons cared for their food and the drinks. They did not have damage and supported their parents well. 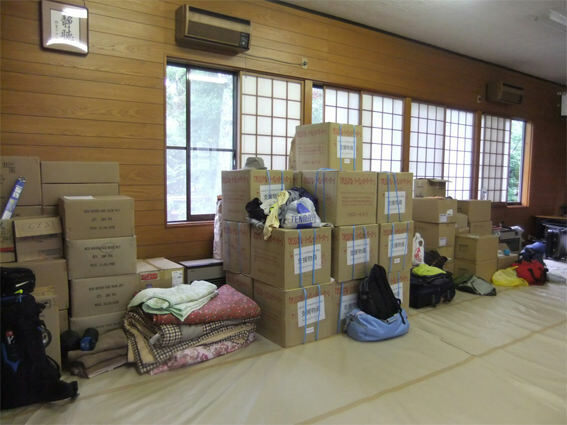 Support supplies also reached them from the relief center, and pastor Toyose took out the necessary things including the clothing from their home. Some roof tiles fell the car windshield and cracked it. 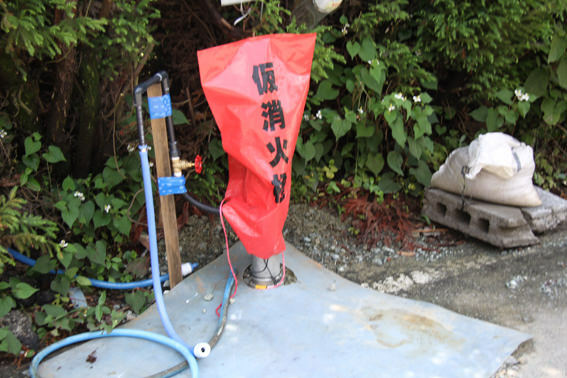 Engine of the car starts, but it is state that it is dangerous to run. 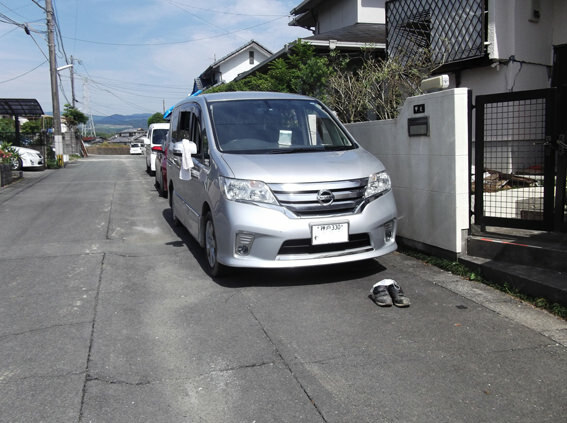 Because the car of their daughter was safe, they move by her car. It was the atmosphere that it was hardly yet thought very much what happened to former life and church from their state from now on. Several members of the church came here anxiously. 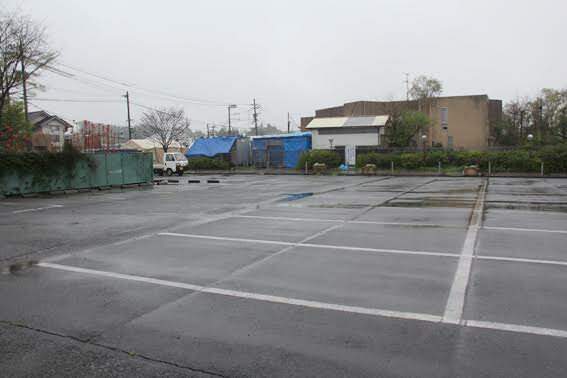 They will display desks at the parking lot in front of church building tomorrow and make a plan of the water supply service to community people. 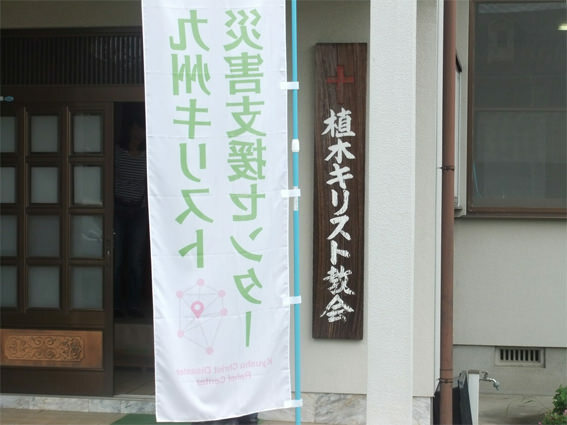 I also went to the Kiyama Christ Church afterwards. There is no damage in the church building as far as I see it from the outside. 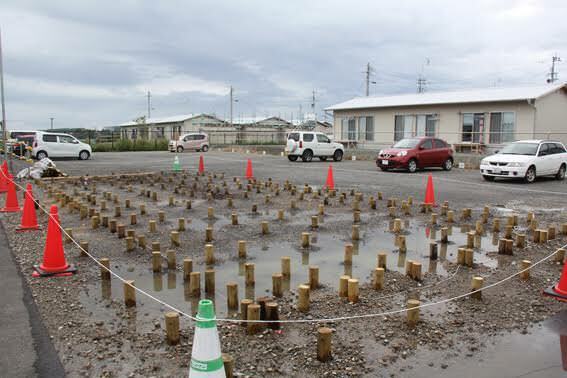 The one round ground only cracks along the building. 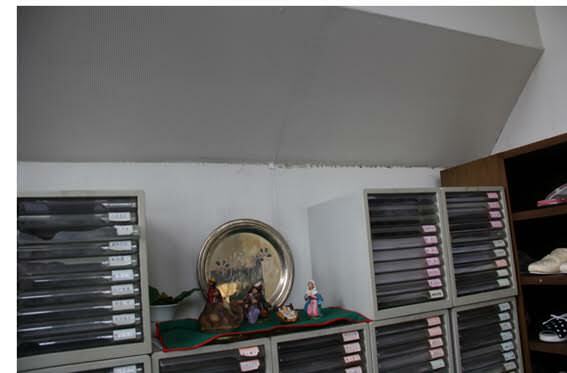 Shelves all fell down, they were wrecked in the building. Most of the tableware was broken. 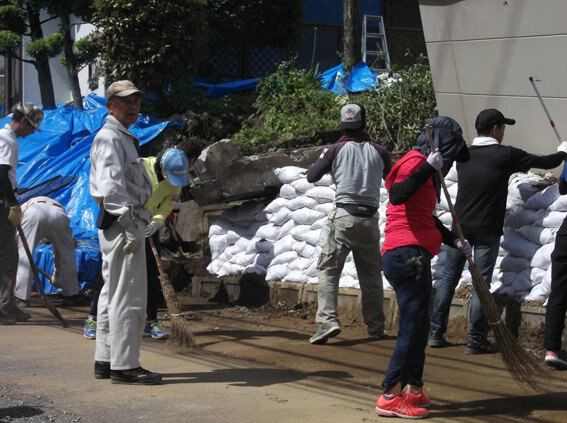 The members of the church gathered and cleared up. I helped it too. 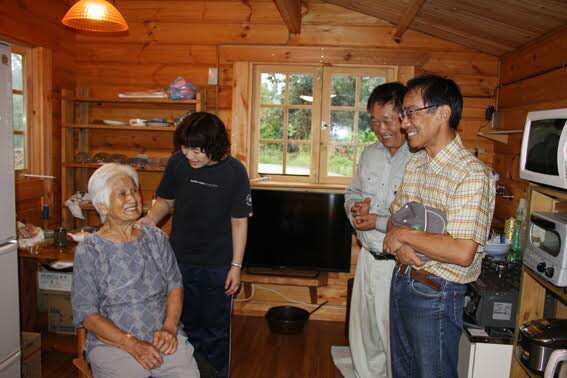 Pastor Mayumi Oda and Pastor Seiko Fujimoto are living now. 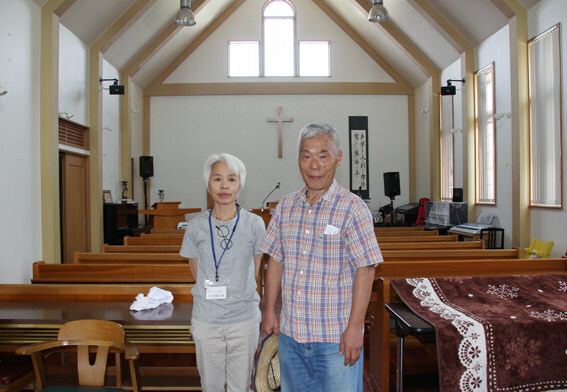 And this church was used as an evacuation site for members of the church and neighboring. 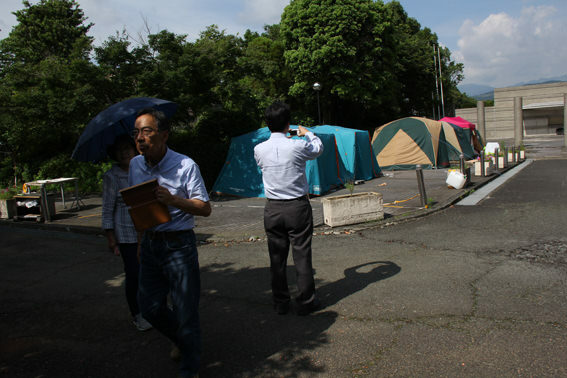 Three persons seem to stay here tonight with Pastor , use it worrying about a gas leak. 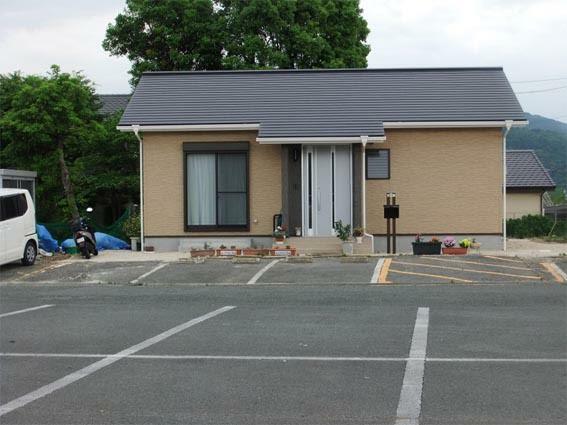 This report from Pastor Izumi Haraguchi . 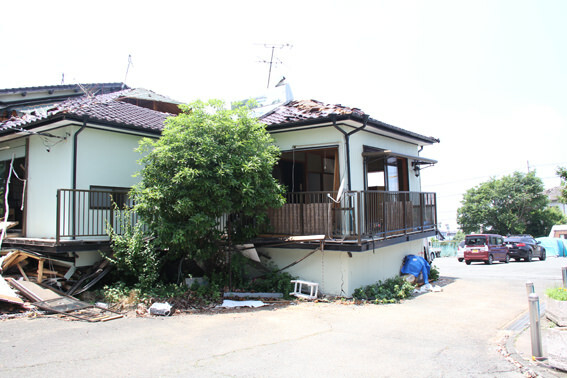 By the way there was the damage that a building shook by the earthquake greatly, and some roof tiles fell down of the house of Pastor Haraguchi the very person. 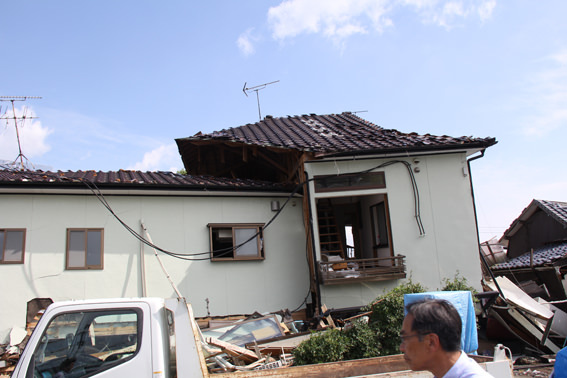 The second-floor roof tiles dropped and broke the first-floor roof tiles. 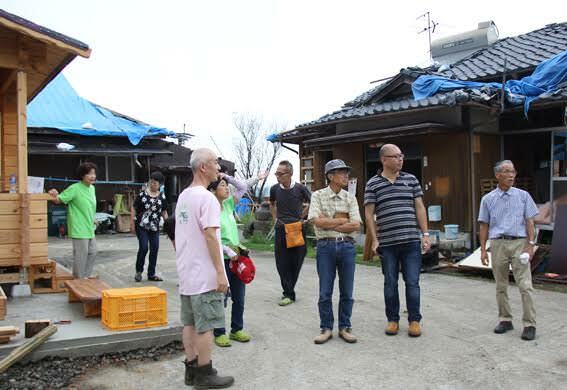 A neighborhood provided a lot of roof tiles for the repair of the roof. 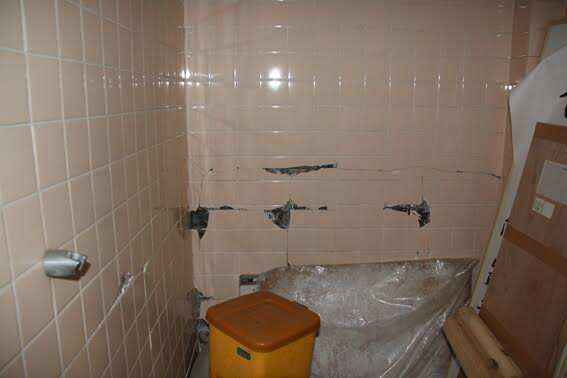 Those tiles were just the same form. It was beyond 150 pieces necessary to repair a broken-part a little, too. That’s exactly that there is the preparation on the Lord’s mountain. 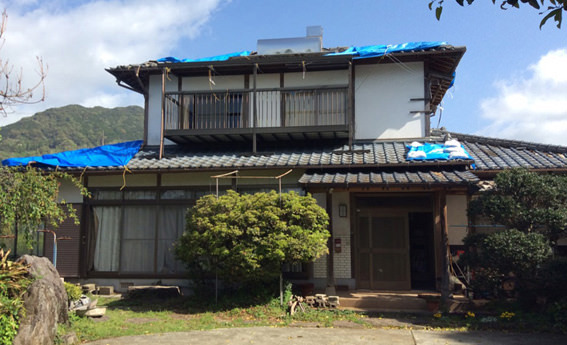 They covered a roof with some blue seats for a rain leak, but Haraguchi family and me Sato have finished the emergency tinker of the roof and were able to take off them. 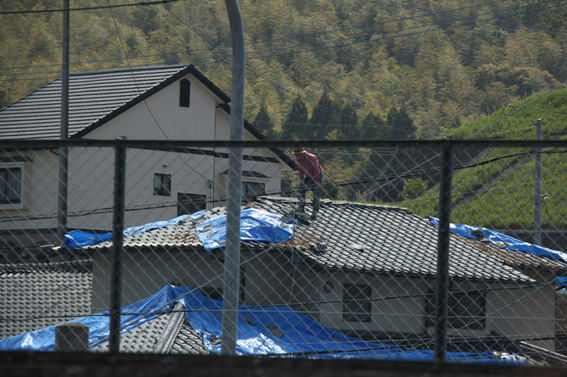 But there were two times of big shaking of the earthquakes when we repaired the top on the roof. 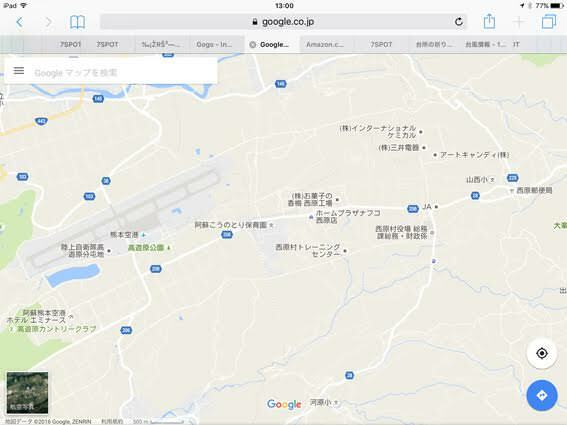 It is more in the middle of the earthquake. 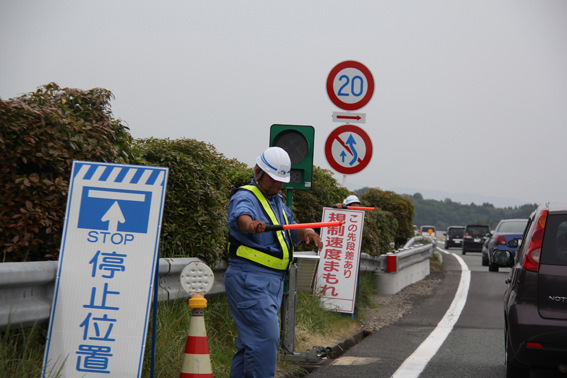 There was such a scene ……in the roadside …. 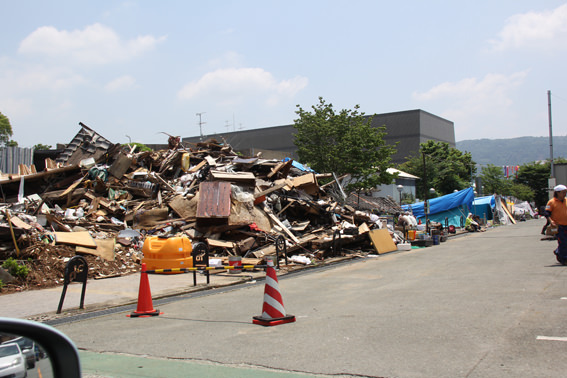 You can go through on this street after clean up now. 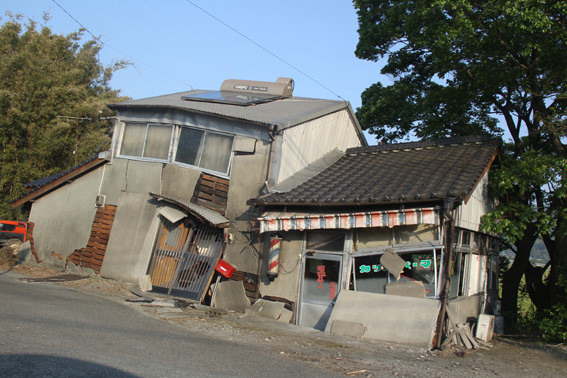 I think the power of the earthquake is very strong. 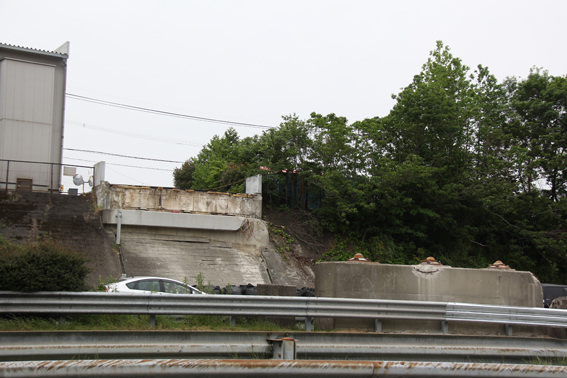 There is the collapse of the expressway, and the neighborhood becomes the one side traffic lane. 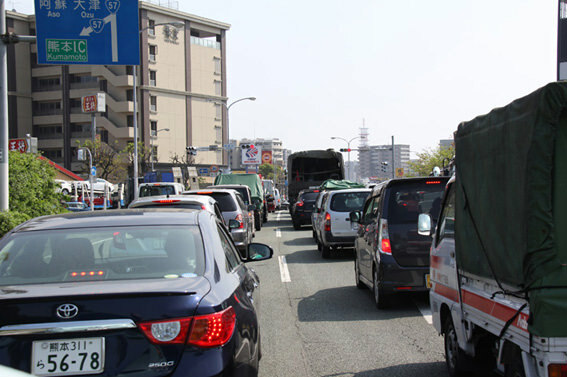 Besides, it is “regulation to temporarily stop.” A traffic jam becomes severe in this again. I pray that there is a comfort and the blessing of the Lord for people suffered from and for the churches suffered from, and there is a preparation for revival. Amen. 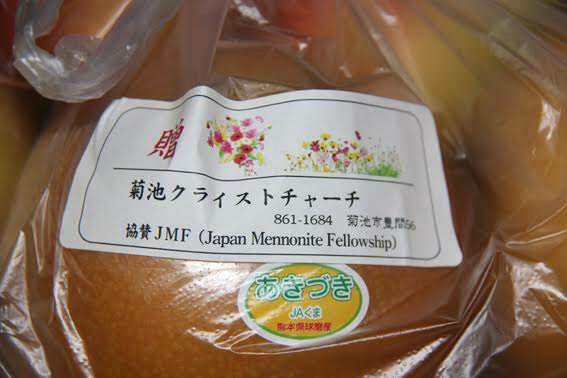 Copyright © 2011 Japan Mennonite Fellowship All rights reserved.